On behalf of The Secretariat of the European Council on Tourism and Trade (ECTT) Director Vasile Vlasin presented the list of the applications for WORLD CAPITAL OF CULTURE AND TOURISM designation by the global tourism institution. The applications for WORLD CAPITAL OF CULTURE AND TOURISM will be debated and approved during the ECTT Executive Board Meeting (23 April 2019). Investment Director for ECTT Vasile Vlasin announced that forty-eight cities (48) and regions from Africa, Asia and America had entered into final evaluation stage and had fulfilled the pre-requisite to be considered for the top cultural and heritage tourism award. These 48 cities and regions are promising to foster a new wave of tourism development across the world and to leverage and support new tourism-related initiatives and to create more than 500.000 jobs in the next three years and to garner a profit estimated to over 1 billion USD announced Mr. Vlasin. By the end of 2019 is expected that out of this 48 contenders two more cities to be registered as WORLD CAPITAL OF CULTURE AND TOURISM. The pressure is great therefore in selecting these two cites that will lead world tourism in the next period stated Academician Mircea Constantinescu (European Tourism Academy). The rest of 46 cities will be re-directed for further analyses in 2020 and in the years to come, concluded Academician Mircea Constantinescu, together with the new candidates that are vying for top cultural recognition. The European Council on Tourism and Trade World Tourism Awards are the flagship recognition for the world`s tourism sector. Since their inception in 2008, the global tourism institution awards recognize the role of culture and heritage around the world in creating a positive impact, fostering peace, understanding and cooperation amongst nations and served as an inspiration for the world tourism. To this moment, European Council on Tourism and Trade has acknowledged the contribution towards peace and development and supported tourism initiatives around the globe creating more than 100.000 jobs in tourism and helping nations across the world in fulfilling their sustainable development goals commitments. The European Council on Tourism and Trade (ECTT) is the global tourism institution responsible for the promotion of culture based tourism, and offering support for responsible and sustainable tourism. It is the leading international organization in the field of tourism, which promotes tourism as a driver of heritage protection, culture advancement. The Professor Dr. Anton Caragea The President of European Council on Tourism and Trade-ECTT (left) and President of Romania H.E. Professor Dr. Emil Constantinescu on the venue of ECTT Executive Board meeting. Office of the President of European Council on Tourism and Trade announced that H.E. President of F.D.R of Ethiopia Ambassador Sahle Work Zewde will receive the OFFICIAL LETTER FOR WORLD LEADERS OF TOURISM AND DEVELOPMENT on behalf of European Tourism Academy “in clear appreciation of your influential vision in carving culture and national heritage of Ethiopia as conducive instruments in building tourism and in ensuring development for your people recognition of the role and significance of tourism on world stage”. Your activities had created what we are celebrating today: ADDIS ABABA victory and selection as the WORLD CAPITAL OF CULTURE AND TOURISM.Ethiopia is an example of development activities, investment protection and facilitation, economic growth and wealth spreading to the nation and this is the creation of your life long experience and devotion to your people. The world community statement of confidence in the bright future of Ethiopia nation and practical measures put in place, made your country succeeding in the WORLD CAPITAL OF CULTURE AND TOURISM competition in recognition of your nation incredible wealth of traditions, natural treasures, history prowess and contribution to humanity legacy. The world recognizes that Trade, Travel and Tourism are part of the international life and each and every one of our citizens became a world ambassador and a central actor on world stage. Nations that wish to attain their full potential and reach the picks of development, international recognition, economic growth and prosperous life for their citizens can’t remove themselves from the international tourism and trade arena. Trade and Tourism are the key pillars for countries and billions of people, worldwide, in their efforts to achieve fully their live potential. 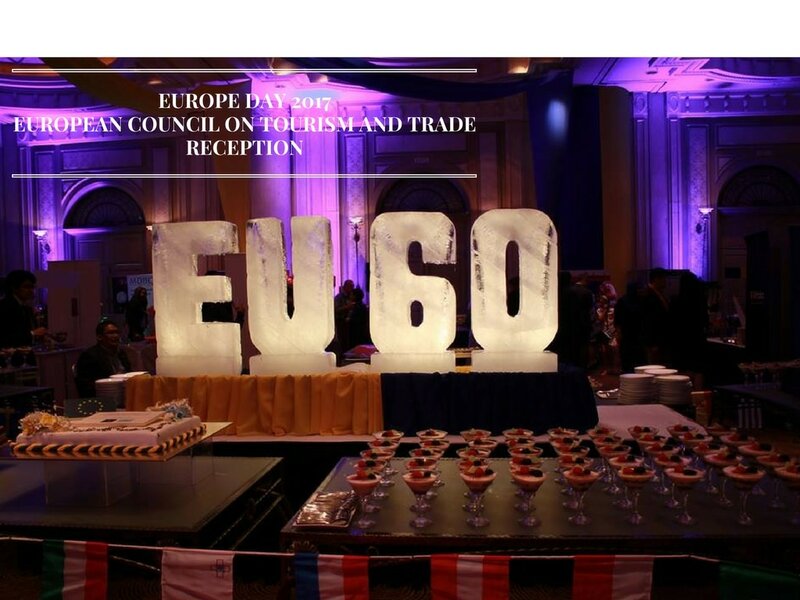 European Council on Tourism and Trade had become, and strides to remain, the driving force in the international promotion of culture, and patrimony and encapsulate tourism as the main vector in development and international cooperation. The international recognition of Ethiopia`s President Sahle-Work Zewde comes in the wake of the global tourism institution –European Council on Tourism and Trade decision to recognize Addis Ababa, the capital of Ethiopia and the seat of African union as receiver of the WORLD CAPITAL OF CULTURE AND TOURISM designation. The Office of the President of European Council on Tourism and Trade announced that H.E. 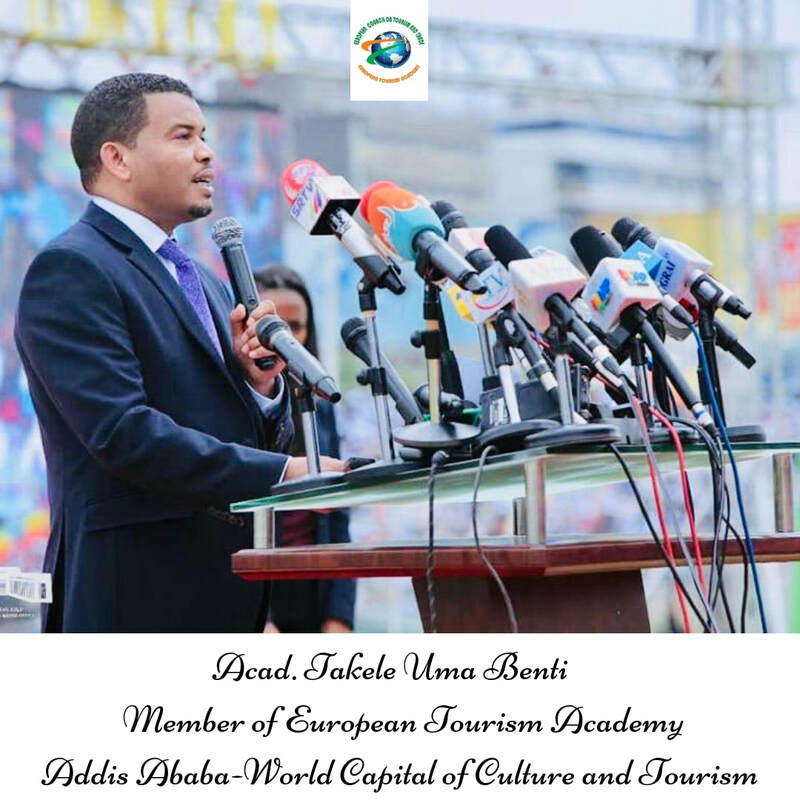 Takele Benti Uma, Mayor and Head of Local Government of Addis Ababa has being inducted as member in the EUROPEAN TOURISM ACADEMY. The decision come after the European Council on Tourism and Trade (ECTT), jointly with the European Tourism Academy and the Parliamentary Assembly for Sustainable Development Goals organized the First Academic and Mayors Forum for Culture and Tourism – ‘WORLD CAPITAL OF CULTURE AND TOURISM: protecting heritage and promoting tourism’, between 16 to 19 January 2019. 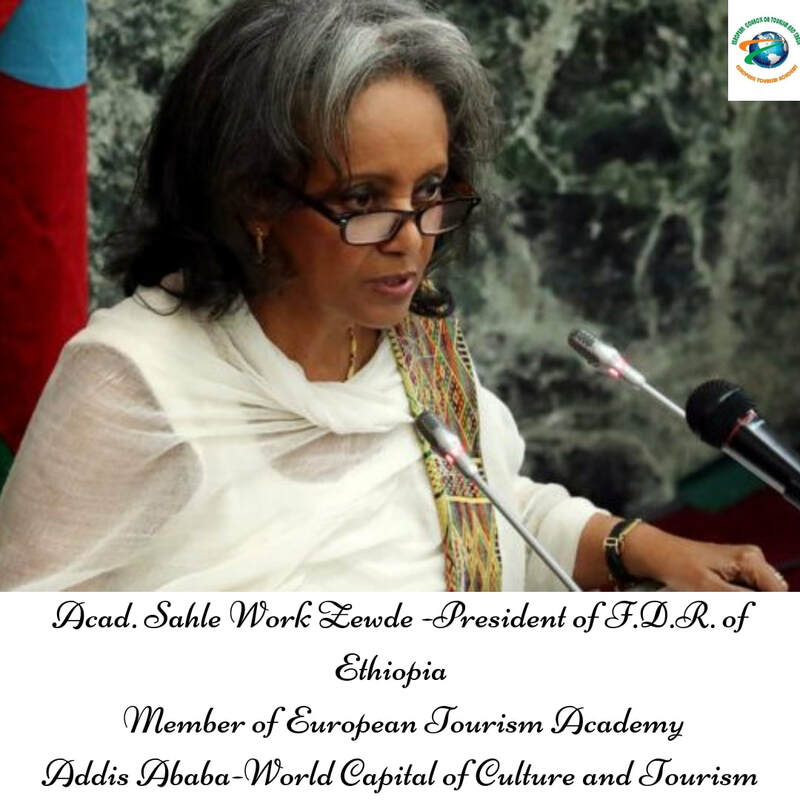 With Your Excellency support, the Government of F.D.R Ethiopia lead by Academician SAHLE-WORK ZEWDE has recognized and abated the importance of culture and tourism as key facilitators for the country development and international promotion. Your Excellency confidence in the bright future of Ethiopian nation and practical measures put in place, made your capital country to succeed in the WORLD CAPITAL OF CULTURE AND TOURISM competition and be accepted as FAVORITE CULTURAL DESTINATION for your city incredible weight of culture, history prowess and contribution to humanity legacy. This is a new momentous achievement for ADDIS ABABA, a moment that is due to your exertions. In your new capacity, as the representative of ADDIS ABABA on world tourism and on international cultural stage, we hope that the World will benefit now from your public exertions and support, in creating a new world community, based on peace, development and tourism as the pillars of international cooperation. Eng. Takele Uma Benti was elected as a member of European Tourism Academy for creating a perfect development team with the nations President office and for his visionary policies that envisioned Addis Ababa as a melting pot not only for all citizens of Ethiopia regardless of region or social class but for all citizens of the world that want to come to invest and build a new Addis Ababa. Addis Ababa is conceived by his administration as “a microcosm of our “rainbow” nation, bubbling with all kinds of diversity—ethnic, cultural, spiritual, and economy. A melting pot where Ethiopia’s many cultures meet and intersect. It’s also our primary gateway to the world and Africa’s undisputed diplomatic capital” this is how Eng. Takele Uma Benti had envisioned Addis Ababa future. The global tourism institution-EUROPEAN TOURISM ACADEMY has appointed Dr. Thong Khon, Minister of Tourism of Kingdom of Cambodia, as the new academician member of the institution rector of world tourism. It is the first time since 2014 when a non-head of state was accepted to this great honor. Dr. Thong Khon makes part of the latest series of world leaders of tourism and development accepted in the leadership position in the European Tourism Academyin order to strengthen the leadership and the director on world tourism, announced H.E. Professor Dr. Anton Caragea, European Council on Tourism and Trade President. Dr. Thong Khon makes part of the latest series of world leaders of tourism and development accepted in the leadership position in the European Tourism Academy in order to strengthen the leadership and the director on world tourism, announced H.E. Professor Dr. Anton Caragea, European Council on Tourism and Trade President. To date 200 top tourism leaders, heads of states, prime ministers, leaders of parliaments are involved in the development of a new world tourism concept, in supporting the global tourism institutions: European Council on Tourism and Trade and European Tourism Academy in charting the course towards an inclusive tourism based on culture, heritage and environment protection. Dr. Thong Khon is one of the longest serving ministers of tourism in the world, taking up the job in 1998 and is the current Hon. Minister of Tourism of Cambodia and Head of National Olympic Committee. Phnom Penh-the new WORLD CAPITAL OF CULTURE AND TOURISM. ♦PHNOM PENH: THE CITY OF WATERS! 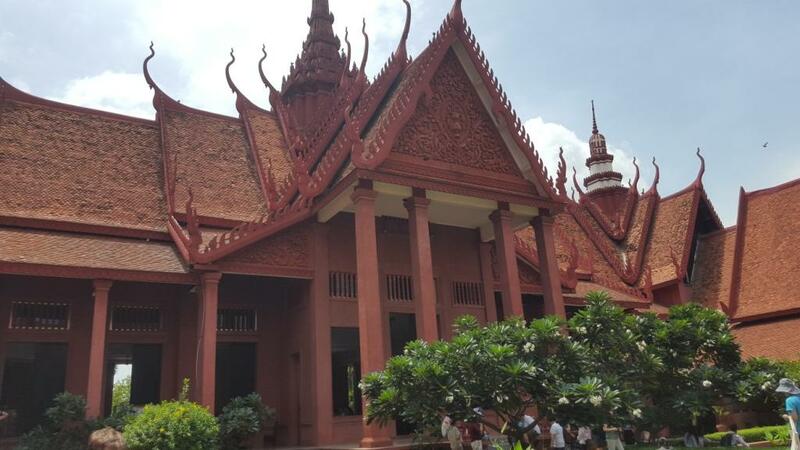 ♦ A VISIT TO PHNOM PENH! HIGHLIGHT OF A PERFECT CITY! He is a member of the Cambodian People`s Party and is a doctor in communication and social science of the University of the Sunshine Coast and Doctor in Arts (Tourism) of Rajamangala University of Technology Thanyabur (Thailand). 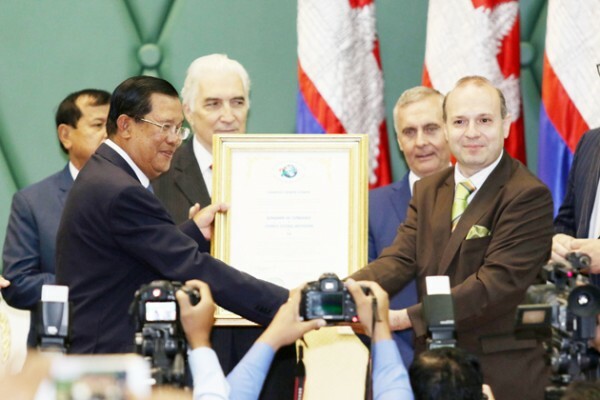 Among his achievements that make him one of the world`s top ministers are: obtaining for The Kingdom of Cambodia the WORLD`S BEST TOURIST DESTINATION AWARD in 2016 and paving the way for the nation most impressive tourism growth in Cambodia`s history. 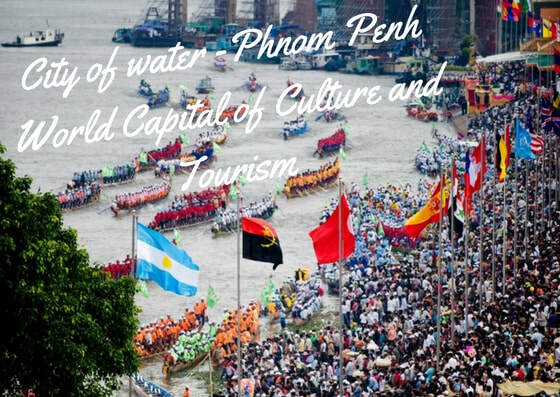 Under his leadership the Ministry of Tourism succeeded in registering the city of Phnom Penh on the list of WORLD`S CAPITALS OF CULTURE AND TOURISM, the first city in Indochina to receive this honor. He was instrumental in launching the strategy of promoting tourism in Cambodia`s littoral provinces and islands, in creating the Mekong paved road in Phnom Penh. He launched successful programmes for monitoring tourism quality, the Clean Cambodia initiative, and hosted the international conference on city culture in 2015. Under his leadership The Ministry of Tourism obtained for H.E. Academician Hun Sen, Prime Minister of Kingdom of Cambodia the official role as GLOBAL AMBASSADOR FOR TOURISM AND SUSTAINABLE DEVELOPMENT GOALS in recognition of his achievements in raising Cambodia from the horrors of war and desolation to peace and development. 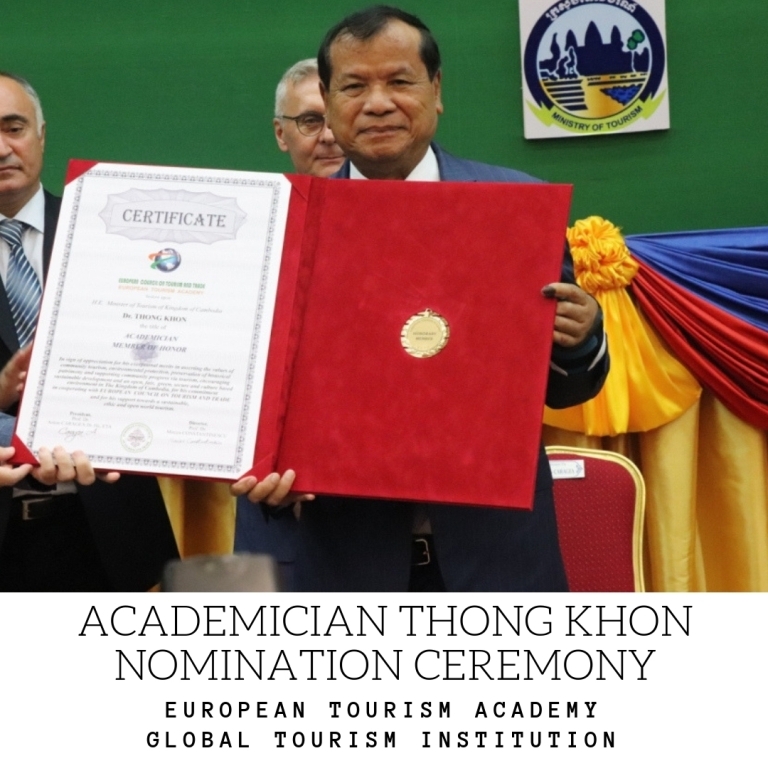 With the selection of Minister Thong Khon as the newest academician in the world`s tourism academy, Cambodia becomes the first country in the world to have two leaders in the European Tourism Academy structures. We mention also that Dr. Thong Khon is the first non-head of state that is selected in the global tourism body since 2014, a honor that speaks volumes about his achievements and strong personality. The designation ceremony was held in Phnom Penh under the presidency of Deputy Prime Minister H.E. Hor Namhong, representative of Prime Minister Samdech Akka Moha Sena Padei Techo Hun Sen, and visiting H.E. 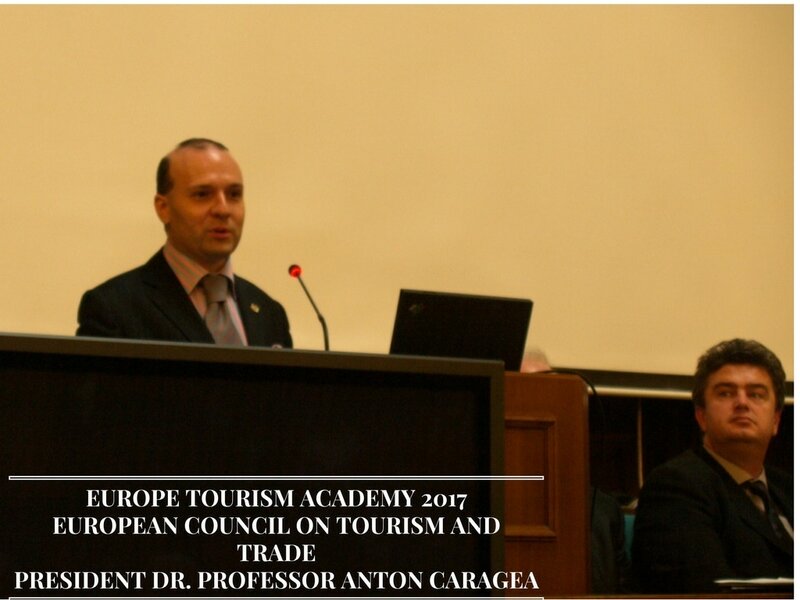 Prof. Dr. Anton Caragea, President of the European Council on Tourism and Trade. Founded in 2005, the European Tourism Academy (ETA) is the research and academic institution of the global tourism organization-EUROPEAN COUNCIL ON TOURISM AND TRADE. European Tourism Academy (ETA) is internationally acclaimed for acting as a catalyst for the responsible development of travel and tourism on the world stage, in supporting the Agenda 2030 implementation and United Nations research initiatives. European Tourism Academy is part of the Parliamentary Assembly for Sustainable Development Goals (PASDG). European Tourism Academy (ETA) provides aligned advocacy, insightful research, and innovative events to its members. In partnership with private and public sector members, European Tourism Academy (ETA) enhances the sustainable growth, value, and quality of travel and tourism, provides leadership and counsel on an individual and collective basis to its member organizations. European Tourism Academy (ETA) is rapidly expanding his activities for marketing, public relations, investments, branding, promoting, and establishing niche markets. The Autumn 2018 Meeting of European Tourism Academy and European Council on Tourism and Trade and the official celebrations for WORLD TOURISM DAY 2018 had taken place at the headquarters of global tourism institution. The events had taken place under the leadership of Professor Dr. Anton Caragea, European Council on Tourism and Trade President and a string of key decisions for tourism and culture future in 2019 had being taken. The main issues debated by the world tourism and culture institutions where the selection of the 2019 host cities for World Tourism Day, and the announcement of official theme of the next year tourism celebration for European Tourism Academy and European Council on Tourism and Trade. This theme will be instrumental also in the selection of new candidates for hosting world tourism awards ceremonies in 2019. 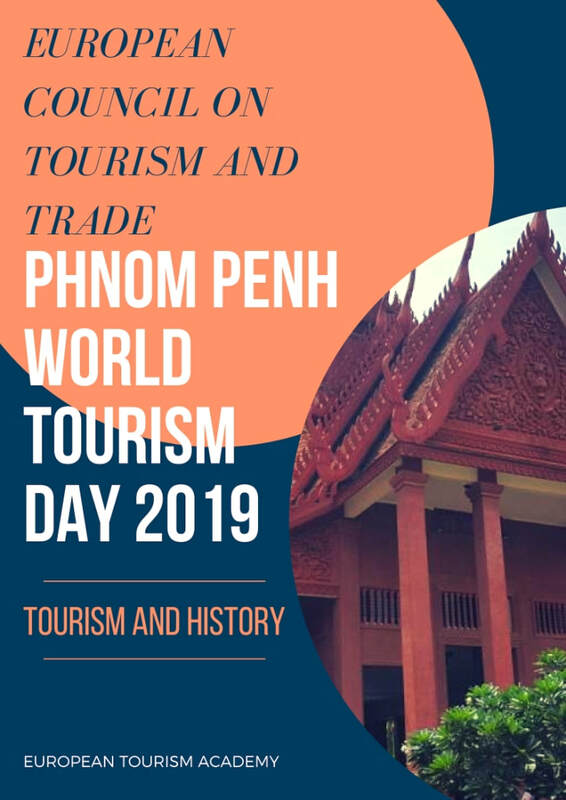 Phnom Penh, the capital of Kingdom of Cambodia and Djibouti city, the capital of The Republic of Djibouti were selected as the official model cities for World Tourism Day celebrations and official hosts of global tourism events. 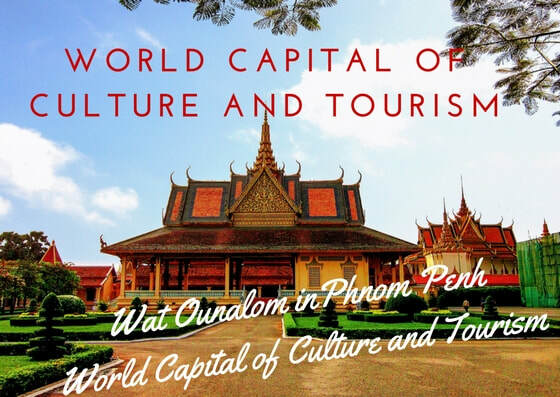 Both Djibouti and Phnom Penh where in previous years selected as World`s Capital of Culture and Tourism and globally recognized as centers of heritage, tourism and culture. The city of Phnom Penh has also obtained WORLD`S BEST TOURIST DESTINATION status in 2016 and hosted the World Tourism Awards ceremonies the same year establishing himself as a powerful tourism and cultural center of Indochina. ♦ PHNOM PENH: THE CITY OF WATERS! Cambodia and Djibouti have won the honor to be global examples in the tourism and cultural world for 2019. On the venue of the same event the WORLD TOURISM DAY 2019 theme was decided to be History and Tourism: A symbiotic relation! The theme is destined not only to enliven tourism during 2019, but also to emphasize that tourism is inextricably linked with historical legacy. History is the main attraction that is creating tourism demand and visitors expectation is linked with the existence of historical and cultural heritage. Tourism must also be organized in such a manner to not impede conservation efforts, to support raising awareness on historical monuments and to help to acquire the financial support necessary for historical preservation activities. Tourism and history are inseparable, are growing from the same tree: the sapling of culture and civilization. History is the root of tourism development and tourism must feed and nurture historical preservation as leaves are feeding the tree said Professor Dr. Anton Caragea-global tourism president. The next year celebration for World Tourism Day will take place in 27 September 2019, placing under the spotlight the culture and civilization as an integral part of tourism growth and role in the sustainable development goals agenda. The European Council on Tourism and Trade was established as the voice of global tourism and culture for European nationsand has gradually evolved since 2005 in the main driver of world tourism development. It is focused on member countries’ politics and statal agenda in terms of tourism and trade and produces strategies, research and studies on tourism and cultural development implemented worldwide. ​Its membership includes state actors, private sector, educational institutions, tourism associations and local tourism authorities. Friendship Building of the Office of the Council of Ministers, July 31, 2018. H.E Hor Namhong, Deputy Prime Minister of the Kingdom of Cambodia! Distinguished national and international guests! The first of all, on behalf of the Ministry of Tourism and myself, I have great honors to respect and deeply congratulate for H.E Hor Namhong, Deputy Prime Minister of the Kingdom of Cambodia, attended as preside over in Congratulatory Ceremony on Designation of myself as a Member of the European Tourism Academy at this time. Taking this time, I would like to thank the European Council on Tourism and Trade and European Tourism Academy, in particular, H.E Prof. Dr. Anton Caragea, as president for previously awarding the Kingdom of Cambodia as the Best Tourism Destination in the world and designed Samdech Techo Prime Minister as an honorary member of the European Tourism Academy in 2016, as well as “Global Ambassador for Tourism and Sustainable Development Goals” on the last 09 December 2017, and today I myself have great pleasure with the most profound and privilege to be designed by European Council on Tourism and Trade as a member of European Tourism Academy. I would like to thank Excellencies, Lok Chumteav, Ladies, Gentlemen, and Professors, Tourism experts, distinguished national and international guests for spending value time attending in the meaningful ceremony for me and my family today. Respectful H.E Deputy Prime Minister! Excellences, Lok Chumteav, Ladies, Gentlemen Distinguished National and International Guests! Under sound and wise leadership of Samdech Akka Moha Sena Padie Techo HUN SEN Prime Minister, Cambodia now enjoys fully peace, political stability, security, order and development on all the fields. In 2017, Cambodia reached about 7% of economic growth of gross domestic product and gross domestic product for per capita in a year increased to 1,443 US dollars. Optimistic Cambodian economic growth index can be possible depended on participation from development on all the fields including tourism sector too. Tourism sector is considered as Green Gold by the royal government of Cambodia contributing to socio – economic development, jobs creation and poverty alleviation for the people as well as playing vital role as on the site exportation and support to regional integration. Obviously, in 2017, Cambodia received about 5, 6 million international tourists, increased by 11, 8%, brought about 3, 638 million us dollars deducted to national economy, contributed 13% to gross domestic product (GDP), and created about over 620, 000 direct jobs. While, during 05 months early of 2018, Cambodia received about 2. 6 million international tourists, increased by 13.5%, compared to the same period in 2017. By prediction, Cambodia is expected to gain about 6, 2 million international tourists in 2018 and 7 million in 2020, bringing about 5 billion us dollars in revenue, creating about 1 million job opportunities. In 2030, Cambodia will be able to receive about 14 million international tourists by bringing about 10 billion us dollars to total revenue, creating about 2 million jobs opportunities. Particularly, domestic tourists, tourist growth is constantly increasing from years to years (4% – 5% average. Obviously, 2016, domestic tourists accounted for over 10, 2 million, increased to 10, 8 million in 2017 and over 11 million in 2018, as vision we expect to have about 19 million domestic tourists in 2015. These results derive from Win Win Policy of Samdech Techo Prime Minister, who makes Cambodia enjoys fully peace, national unification, national conciliation and territory, security and social safety throughout the nation which is a major foundation for development on all the fields, in particular strongly supporting from Cambodian people nationwide for the royal government, led by Cambodia People Party, having Samdech Techo Prime Minister as leader throughout supporting election for the party to get landslide victory in election of the 6th national assembly election on the last recent 29 July 2018, which this election got highly assessment from national and international observers as well as delegation of European Council on International Relations that this election was conducted in free, fairs and justice manners. – Respectful H.E Deputy Prime Minister! – Excellences, Lok Chumteav, Ladies, Gentlemen Distinguished National and International Guests! Subsequent development of Cambodian tourism sector is not interrupted from increasing attractiveness of Cambodia, as attractive tourism destination both regionally and globally as well as leading based on policies and strategies in accurately and comprehensively manners. Basing on this growth, seriously and inclusively consideration are necessary, especially there have been development plans and tourism management with inclusively in the same time the world has been constantly encountering new evolution's both socio – economic and environmentally and natural disaster. In this sense, cross – sector systematic tourism sector is able to impact and suffer bad influences from global issues. All of these problems are the results of global population increase in which according to prediction of United Nation in the upcoming 2050, the global population will increase to about 9. 8 billion and 2/3 of these numbers are expected to live in city and surrounded areas by they will use the powers about 67% – 76% of total powers and will release 75% of carbonic in worldwide. In response to these issues, consideration on concept of “Clean and Green” is the most necessary and significant in time the world is moving ahead in green era. Standing on this spirit and basing on strategic principle of the royal government, Cambodia has been being continued developing tourism to be clean and green tourism destination, providing service with qualification and warm for tourists basing on principle of sustainable, responsible and institutional development on the basic of wonder of Angkor Temple, Preah Vihear Temple, tangible and intangible heritage properties, natural resources, beautiful beaches, the most beautiful bay in the world, beauty of Mekong river, foods, customs of living with smiling and naturally attractiveness of Cambodian people in accordance with nickname of (Cambodia: Kingdom of Wonder – Feel the Warmth). enhancing domestic tourist movement, the ministry of tourism has been improving management and developing existing tourism destinations, creating tour packages with proper price along with calling investments on producing further new tourism products to be more variety, creative and prosperous both national level and prioritized tourism destinations. Taking this time, I would like to high value on and thank for cooperation and efforts made by all related institutions and parties; both state, private, community people and tourists, supported and participated with the Ministry of Tourism in accomplishing Cambodia tourism development which will be benefits for us in the present and for next generations. Today, I do have proud of and most privilege to be recognized and high valued on previous works throughout accomplishing in assigning me as a member of European Tourism Academy, and this is a proud and a privilege for Cambodia tourism which we all accomplished. The today successful achievement is really derived from sound and wise leadership of Samdech Techo HUN SEN Prime Minister which is a great merit for me. Along with this, this success cannot be interrupted from participation of colleagues with high responsibility and all level officials of the Ministry of Tourism as well as the supports and good cooperation of all related institutions, private sector, development partners and the people. The membership whom I got is for the Ministry of Tourism and the whole Cambodia tourism industry. The assigning me was made at the same time Cambodia has been catching opportunity from tourism development both ASEAN region, Asia Pacific region and the worldwide. In this regards, I do have optimistic believe that via membership of European Tourism academy, we will be able to share, to exchange views, knowledge, practice and further new researches on the preparation and promote policy implementation and Cambodia tourism development strategic plan. Along with this, the Ministry of Tourism, with cooperation from Microfinance Institutions, put out loan program for students in tourism which enable students to get loan for studying in low rate. And today, to participate in preparing policy and develop Cambodia tourism development strategic plan to be more effective, the ministry of tourism prepared to form “professional network and professors in tourism sector” by assembling experts, professors in tourism in order to contribute to share knowledge, experience, good practices, as well as using their skills in contribution in other capacity buildings, training human resource on tourism with competency and real professional. Once again, I myself and my family would like to deeply thank for His Excellency Hor Namhong, Deputy Prime Minister of the Kingdom of Cambodia, attended as highly testimony in congratulatory ceremony on my assignation as a member of European Tourism Academy this time. In name of the Ministry of Tourism, I would like to deeply thank for His Excellency Prof. Dr. Anton Caragea, President of European Council on Tourism and Trade and his colleagues who always support to Cambodia tourism development, and would like to thank for participation of Excellences, Lok Chumteav, Ladies, and Gentlemen, Professors, Experts, Distinguished national and international guests in the meaningful ceremony for me and my family today. At the end, I would like to wise Excellency Deputy Prime Minister, Excellences, Lok Chumteav, Ladies, and Gentlemen, Distinguished national and international guests to meet with 4 blessings: Long life, Health, Happiness, and Strength. Prime Minister of Cambodia-Academician HUN SEN the author of the famous hunseneconomics and the artisan of the country incredible development had succeeded in placing his country on the top of tourism development. 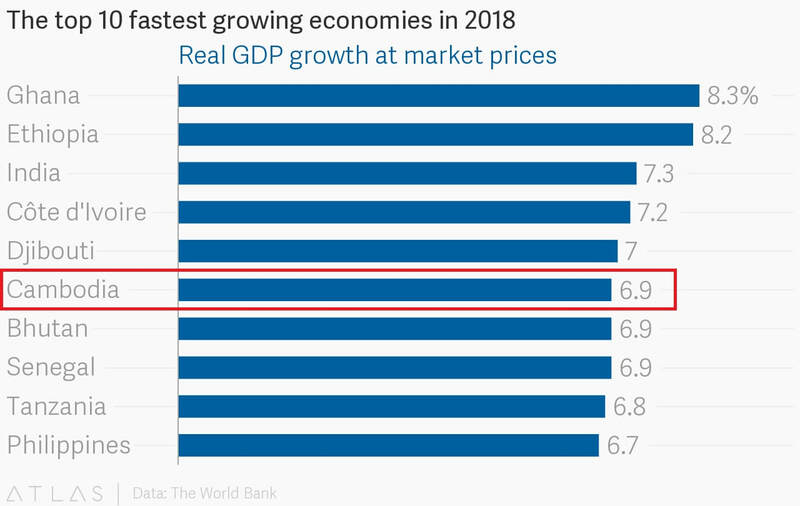 ​The Kingdom of Cambodia has many reasons to celebrate as the World Bank has just ranked the country as the world`s sixth economy as growth rate in 2018 topping many other nations and established investment destinations. 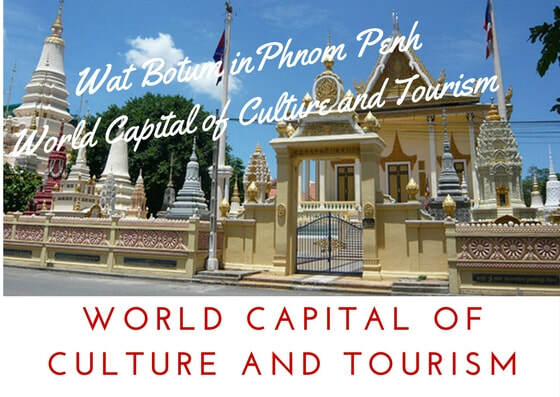 The main reason for World Bank rating was the country incredible tourism developments in the last years starting with the Kingdom being selected as WORLD`S BEST TOURIST DESTINATION a moved that brought a supplementary 1 million tourists in 2016/2017 and the capital Phnom Penh being selected as WORLD CAPITAL OF CULTURE AND TOURISM another landmark that brought a new 1,5 million tourists to the Asian Kingdom. These successes had brought about and a flash flood of investments with more than 3 billion poured into the country tourism sector since Cambodia acquired the WORLD`S BET TOURIST DESTINATION status. After Phnom Penh was selected WORLD CAPITAL OF CULTURE AND TOURISM the American giant Marriott announced it will open a Courtyard Hotel by Marriott is slated to open its doors in 2018 with a total of 189 rooms, all-day dining, a dynamic lobby cafe, and a sky bar. Recently in the wake of Phnom Penh being announced as WORLD CAPITAL OF CULTURE AND TOURISM, David Udell, Hyatt Hotels’ Group President-Asia Pacific, said: “As Phnom Penh becomes known as a destination for art, culture, tourism and business, we are confident that the globally recognized Hyatt Regency brand will resonate with business and leisure travelers visiting the country”. As a result, Hyatt Regency Phnom Penh, the new announced investment in WORLD CAPITAL OF CULTURE AND TOURISM will have 250 rooms, restaurants, a rooftop swimming pool and bar, as well as a convention center. Finally, the high-end Rosewood Hotel is scheduled to open in 2018. It will be a deluxe property with 175 rooms and suites. 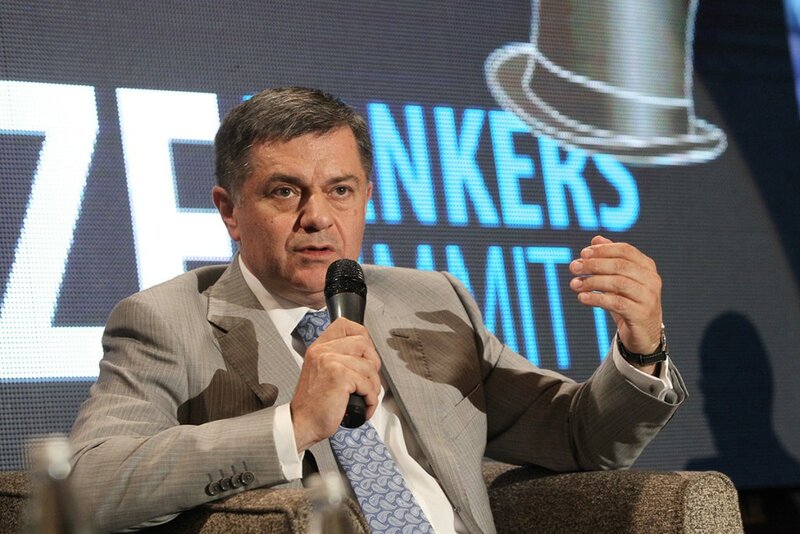 Now the designation of the country as the 6th economy in the world in terms of opportunities, investment climate and growth will mark the nation as a hot spot for future investment in tourism and culture related sectors, stated European Council on Tourism and Trade President Professor Dr. Anton Caragea. These sectors will continue to boom, attracted by the country political stability, pro-business climate enacted by the Academician Hun Sen, the Kingdom Prime Minister and high honesty and probity of his government remarked also President Dr. Anton Caragea. 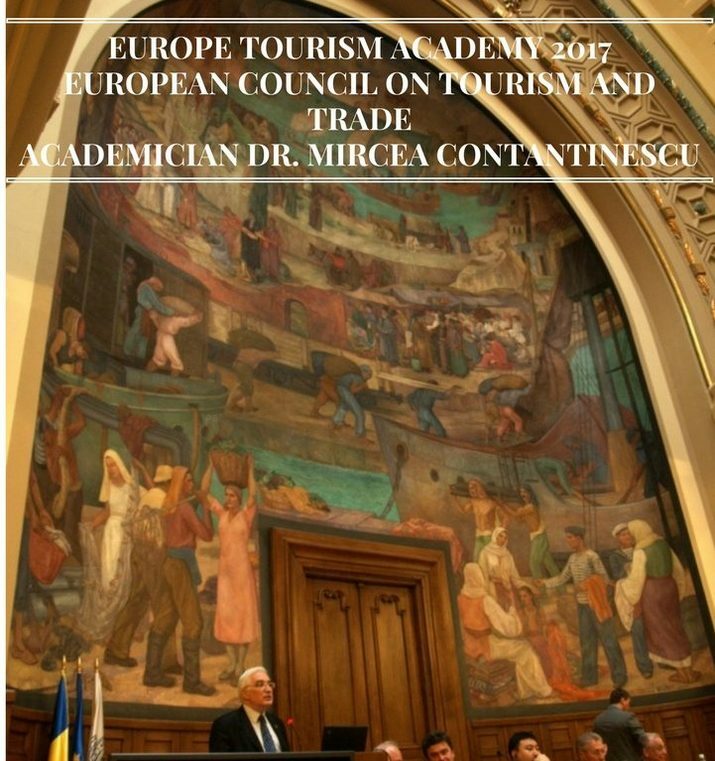 Academician Mircea Constantinescu, European Tourism Academy Director mentioned also: these accomplishments are the direct result of the supervision of the GLOBAL AMBASSADOR FOR TOURISM AND SUSTAINABLE DEVELOPMENT GOALS- Prime Minister HUN SEN and are proving our righteousness in proposing his policies as a world model. The global tourism institutions of European Council on Tourism and Trade and European Tourism Academy will continue to assist and foster this climate of confidence and flurry of developmental activities that made the country a WORLD BEST TOURIST DESTINATION and now the world sixth economy. It is with great joy and pride that I welcome this distinction. Through me, it is Djibouti and its population that you just honor. Therefore, first of all, Mr. President, on behalf of the people of Djibouti, I thank you personally as well as the academy that you are leading for this mark of trust and esteem that you show us. This distinction, Mr. President, as meritorious as it may be, we take it neither as a consecration nor as a reward. But as an encouragement. An encouragement to persevere on the path that we have traced in the development of tourism. It is always rewarding to be supported in its efforts, especially by an institution like yours that has always defended a vision of tourism and culture centered on the human. There are different ways to define and perceive Djibouti and its people. Some speak of us as a pebble in the middle of the desert. Others, no doubt nostalgic of a colonial era yet gone, we reduce to a sign on which is written "Territory of the Afars and Issas". The most innovative identify us with a geostrategic basis for the military powers. But fortunately for us, ladies and gentlemen, there are still many people around the world who do not reduce us to these anachronistic clichés and labels. For us and for all those citizens of the world who have had the opportunity to stay in our country, Djibouti, it is this land of meetings and exchanges at the confluence of all roads, maritime, land and air. For us and for all these citizens of the world, Djibouti is a story and even a prehistory that geology, geography and archeology keep telling through times and ages. Those who marveled at the pristine beauty of the Lac Abbé, those who accompanied a caravan on the ice floe of Lake Assal, those there have the feeling of what is Djibouti. And it is probably because they felt the magic of a captivating space that Tazief and Rimbaud spoke in their time of "a book of open geology" and "a lunar landscape". We are therefore looking forward today to this international recognition of our country as "World Capital of Culture and Tourism". Our country contains sites that are well worth detours. I mentioned Lake Assal and Lac Abbé earlier, but I could have mentioned the prehistoric frescoes of Abourma or the primary Forest du Day. I could also mention the extraordinary biodiversity of our flora and fauna which includes endemic species such as Djibouti Francolin or Beira gazelle. I could also mention the extraordinary cultural richness of our communities. These nomads rooted in their territories. But also these citizens who are the fruits of a historic melting pot, and which makes Djibouti a haven of tolerance and living together. In our development strategy for our country, we are very sensitive to the benefits of tourism, its impact on growth, and its role in the fight against poverty. In a decade and thanks to all the efforts made to increase its attractiveness, our country has more than quadrupled the proportion of tourists. Naturally, the Government is encouraging this job-creating dynamic for our youth and generating foreign currency for our economy. So much so that we have not hesitated to build the tourism industry as one of the economic pillars of the 2035 vision. In the frenzied global competition that drives the tourism sector, we want to remain lucid to avoid falling into certain pitfalls. ​We do not want to sacrifice to all-tourism territories and ecosystems that we know as fragile. We do not want to build this still burgeoning sector on an economic model that plunders and torpedoes the ecological balance of territories and populations. Faced with the short-term and consumerist promises of a tourism industry that often degrades, pollutes and destroys, we want to get out of the Manichean trap of all-tourism or its opposite, for a responsible solution that integrates the tourism industry into a development plan sustainable. 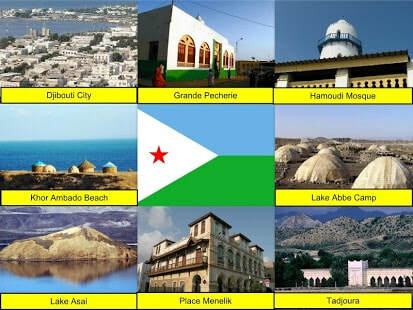 Djibouti has chosen a niche tourism that connects individuals, cultures and civilizations. The choice of a tourism that has an important role to play in the dialogue of cultures and in living together. The choice of balance between our development objectives and the indispensable protection of our social, cultural and environmental heritages. It is a difficult choice whose dividends, although promising, are still meager. But a choice that my country assumes for the sake of fairness and justice for future generations of our country. Thank you for your attention! 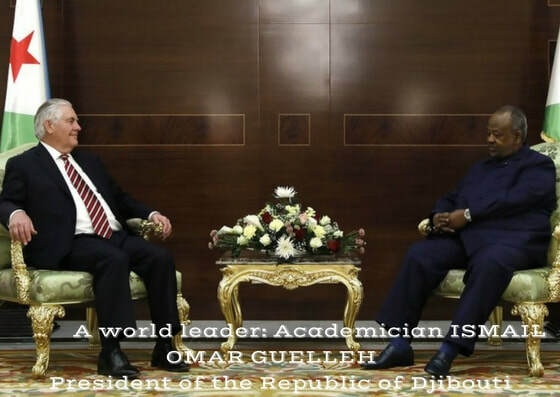 ACADEMICIAN MIRCEA CONSTANTINESCU: PRESIDENT ISMAIL OMAR GUELLEH IS ONE OF THE GREATEST LEADERS THAT AFRICA IS HAVING TODAY! We are here for the induction ceremony of H.E. 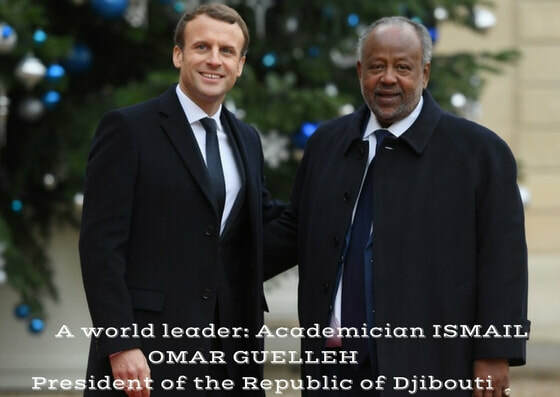 Ismail Omar Guelleh, the President of Djibouti as the newest member of European Tourism Academy and to confer upon His Excellency as in academic tradition the Medal of Honor of the European Academy. As prescribed by the protocol the presentation of the new member of Academic community is made public for the benefit of a global audience. Analyzing the curriculum vitae along with the activity of the President Ismail Omar Guelleh we discover a complex person, a man of many talents, entirely dedicated to the development of his country, to the well being of the people of Djibouti, dedicated to building a favorable image of Djibouti in the midst of the international community. Serving his countries in many administrative capacities gave him access to a high level of knowledge and expertise, and was fundamental for building a solid education and experience in managing the country, giving him an European and international perspective upon the transfer of knowledge, expertise and technology. We can say that Djibouti is not only a beautiful country. But is having a great president in his service! ​H.E. Ismail Omar Guelleh loves his country and the people of Djibouti. He learned how important the resources are for a country, how important the expert management of such vital resources is for the well being and the successful development of Djibouti. But during the years of his presidency he wanted more…He wanted to acquire knowledge of scientific management of the country, of its human resources and natural resources as well. 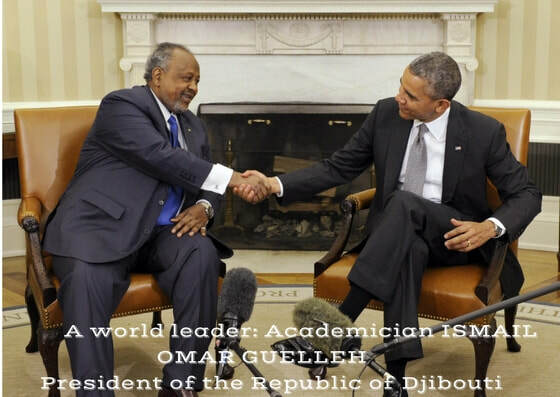 We may say that during his years of Presidency, President Guelleh put again Djibouti on the world map. A wise internal, regional and international policy made Djibouti a point of balance, a strategic area, an extensive zone of stability and peace. During the last decade, President Guelleh carried extensive talks and negotiations with the leaders of the most powerful nations of the world (United States, France, the traditional partner, and China, the new dynamic financial, economical and strategic partner). Using a diplomatic language we may say that under the Presidency of H.E. Ismail Omar Guelleh, Djibouti became a country exporter of security and stability at a local and global level. President Guelleh also addressed in a positive manner to global problems that adversely influence mainly countries of the world: poverty and hunger, persistent unemployment and armed violent conflicts and climate change. 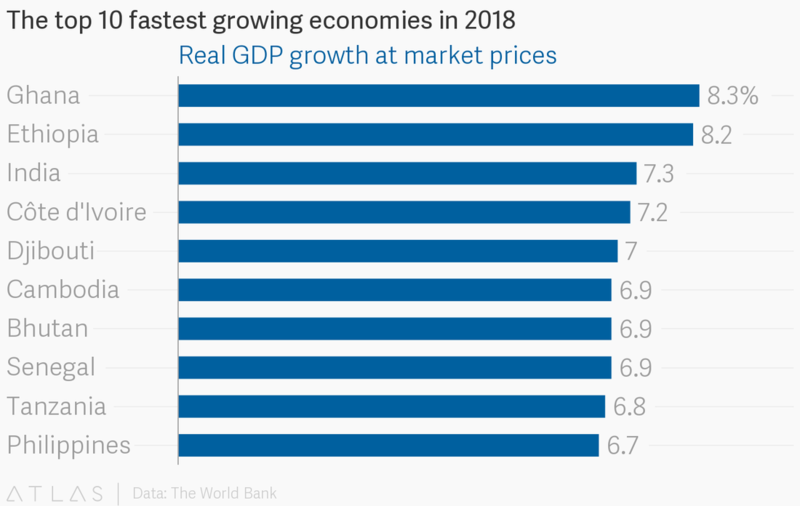 With Djibouti firmly inscribed this year as the number five economy in the world in terms of economic growth rate we can appreciate that Djibouti is on the right track. The complex ties and trade policies connecting Djibouti with Ethiopia are also an example of successful cooperation between neighboring countries. We will not analyze here in extensor the political activity of H.E. President Ismail Omar Guelleh , but taking actively part in the political life of his country, it gave him the opportunity to work with people of Djibouti, to be in the middle of people of Djibouti, to efficiently communicate, and being able to implement at the highest level the management of the country activities, reflecting the reality of Djibouti and the wishes of Djibouti people. The most valuable resource of a country are its people, the young generation as educated people imbeded in a local and international culture and education. And specially in this real we must emphasize a strong line of achievements that will highlight Djibouti future for years and years to come. The honorary titles received in this regard by the President Ismail Omar Guelleh in Turkey, from the University Yildirim Beyazit, along with the President of Turkey, Recep Tayyip Erdogan, and in Ethiopia from the University Hararmayo represents only a tiny piece of recognition of the effort and the interest of the President in supporting the education and culture in Djibouti. For the interested we invite them to visit at least the 7000 students of the University of Djibouti (with Faculties of Law, Economics and Management, Science, Medicine, Engineering, Humanities, Languages and Social Sciences). At last but not least, H.E. President Ismail Omar Guelleh carefully and efficiently supported many humanitarian initiatives developed in the projects coordinated by the First Lady Mrs. Kadra Mahamoud Haid, for the benefit of the health of many young women, for the empowerment of the new generation of women’s and opening the gates of education and responsibility for thousand of djiboutians. His Excellency activity in the area of foreign affairs was indeed another work of impressive success. 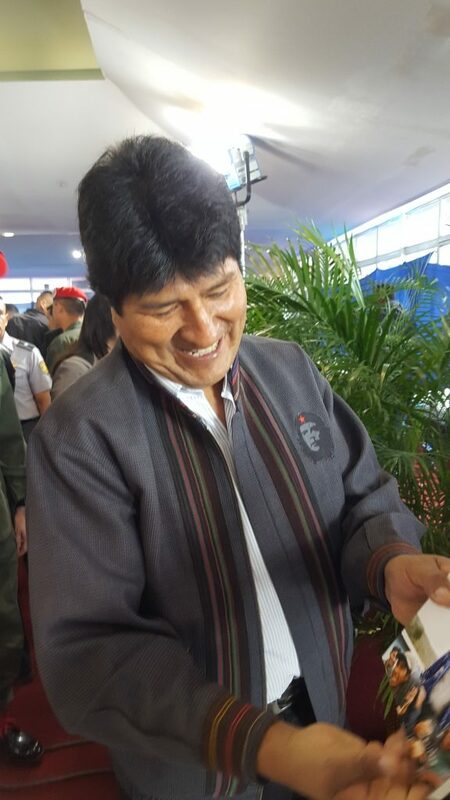 As a diplomat he presented to the world the image of a peaceful country, of many resources and beauties, with people that praise hospitality, open in a friendly manner to the international community. Today celebration when we crown Djibouti as a WORLD CAPITAL OF CULTURE AND TOURISM is the direct recognition of these years of diplomatic activities, of investments in promoting the image of the country, opening vast infrastructure programs that made the Djibouti the place where all the trades, tourism and diplomatic roads of the world start. 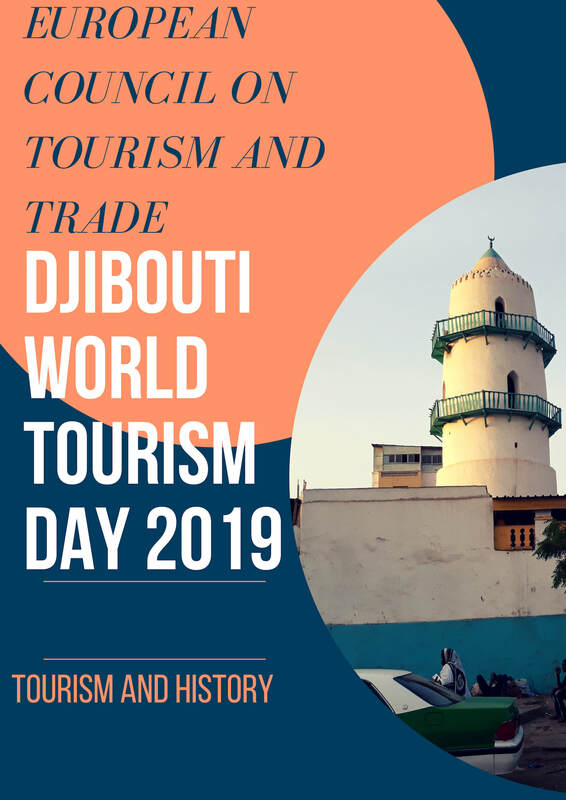 Transforming Djibouti in the last twenty years in an oasis of peace, obtaining for his country the global recognition and inscription on WORLD CAPITAL OF CULTURE AND TOURISM list are historical achievements that need to be rewarded. 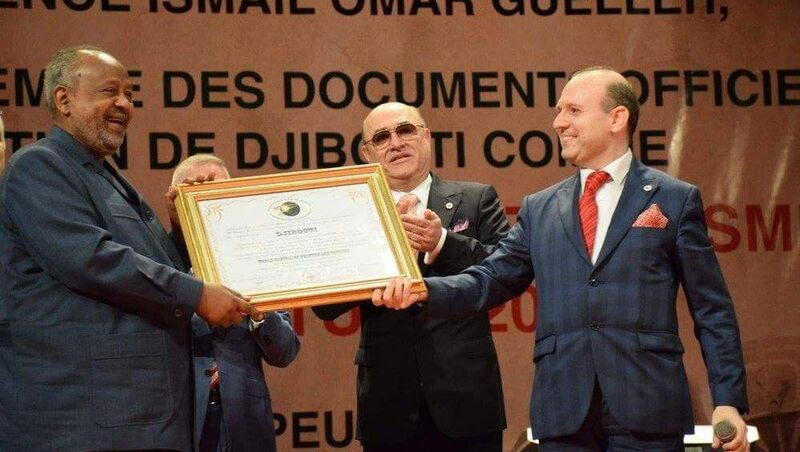 ​In recognition of his life-long contribution to the development of Djibouti, we are proud to hand over The Medal Of Honor to his Excellency Ismail Omar Guelleh, President of Djibouti and to recognize him as the newest academician of the European Tourism Academy. Le président du Conseil Européen du Tourisme et du Commerce, le professeur Dr. Anton Caragea, présente les activités du nouvel académicien: H.E. 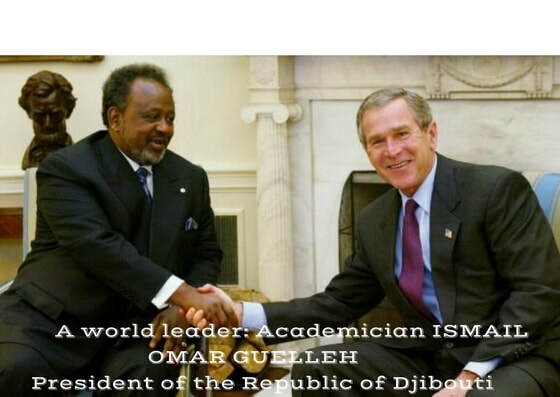 Ismail Omar Guelleh de Djibouti.Président de la Roumanie (1996-2000) L’académicien Emil Constantinescu assiste à la cérémonie (photo à gauche). ​En acceptant la Lettre du CONSEIL EUROPEEN DU TOURISME ET DU COMMERCE (EUROPEAN COUNCIL ON TOURISM AND TRADE),le Président du Djibouti- Ismail Omar Guelleh ajoute son nom à la liste des dirigeants mondiaux cherchant à mobiliser des soutiens pour le tourisme, présenté comme un secteur clé pour la croissance et un développement plus équitable. ​President Ismail Omar Guelleh va recevoir la « Lettre aux dirigeants mondiaux du tourisme et du développement » en reconnaissance de son leadership visionnaire. Président Ismail Omar Guelleh artisan d`une politique a grande echelle va etre elu comme member de L`Academie Européenne du Tourisme en reconnaissance de son leadership visionnaire. « La Capitale Mondiale de la Culture et du Tourisme » est un événement majeur mondial pour l’industrie du voyage. ​Lors de la première journée du « La Capitale Mondiale de la Culture et du Tourisme » le Président Ismail Omar Guelleh recevra le titre de Académicien, member de L`Academie Européenne du Tourisme en reconnaissance de son leadership visionnaire à travers sa politique de réconciliation, de tourisme durable, de conservation de la nature et de développement économique attirant des investisseurs majeurs dans l’hôtellerie. Plus recent le secretaire d’etat americain Rex Tillerson a rendu son hommage a la vision d`avenir de S.E. 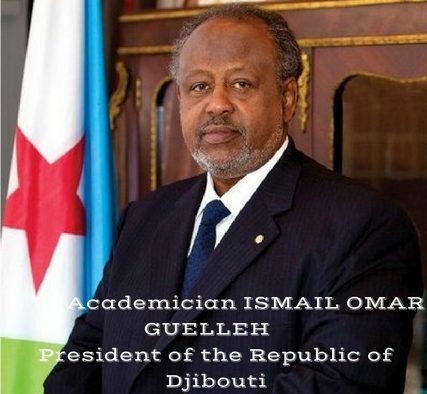 Académicien Ismail Omar Guelleh, President de la Republique de Djibouti. En tant que destination d’investissement privilégiée, le Djibouti a mis en place plusieurs initiatives pour assurer un environnement propice aux affaires. À ce jour, Djibouti est considéré comme la cinquième economie au monde (selon la Banque Mondiale)- au regard de la taux de croissance et une destination concurrentielle pour les entreprises en Afrique, ce qui a encouragé encore plus d’investissements étrangers dans le secteur du tourisme. Djibouti est considéré comme la cinquième economie au monde (selon la Banque Mondiale)- au regard de la taux de croissance. European Council On Tourism and Trade President, Professor Dr. Anton Caragea presents the activities of the new academician: H.E. 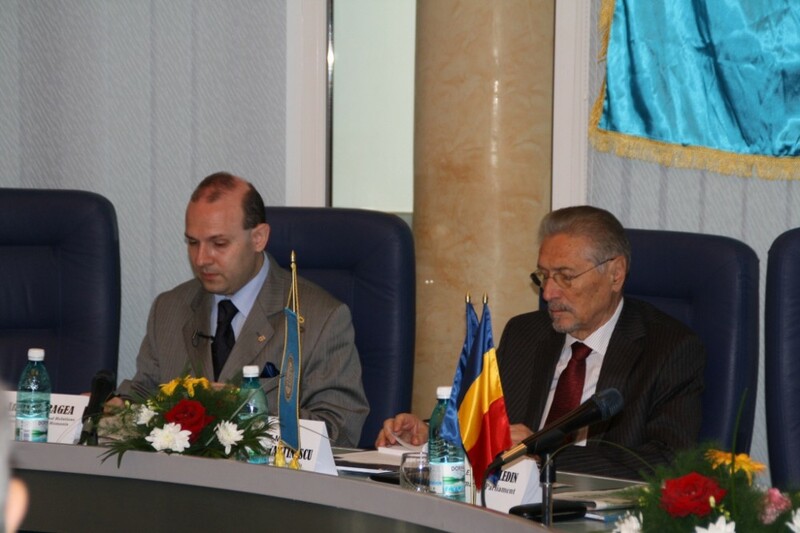 Ismail Omar Guelleh of Djibouti.President of Romania (1996-2000) Academician Emil Constantinescu attends the ceremony (photo left). According to the motto: KNOWLEDGE TO LEAD THE WORLD! The EUROPEAN TOURISM ACADEMY has accepted in his midst a new global leader in development and tourism ready to bring his contribution to the universal agenda for sustainable development. 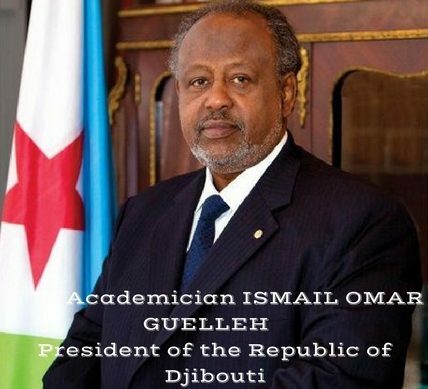 The name of the new personality recognized as world leaders : Ismail Omar Guelleh-The President of Djibouti. As it is the academic tradition, The Letter destined for World Leaders of Tourism and Development will be presented to H.E. 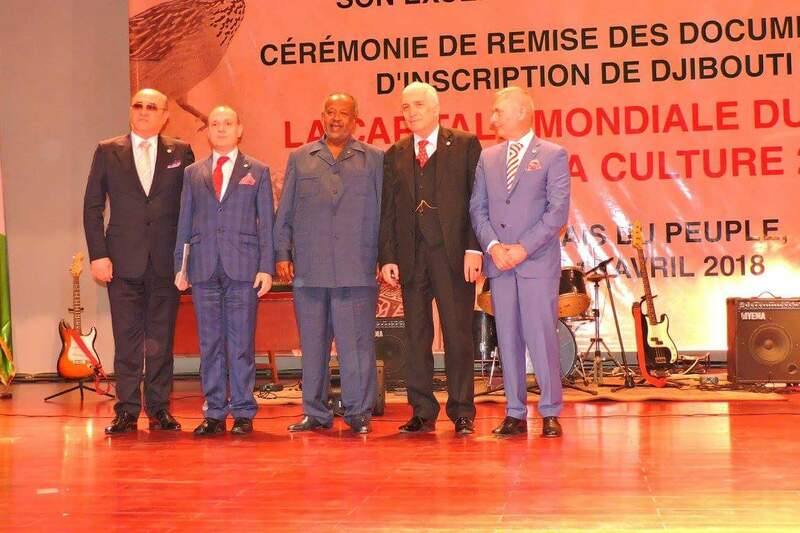 President Ismail Guelleh on the opening day of World Capital of Culture and Tourismfestivity by European Council on Tourism and Trade President-Professor Dr. Anton Caragea. The European Tourism Academy encompass world leaders who proven themselves as creators of outstanding initiatives related to world development, tourism growth, tourism diplomatic initiatives and in fostering sustainable tourism and developing programs that give back to local and global communities. 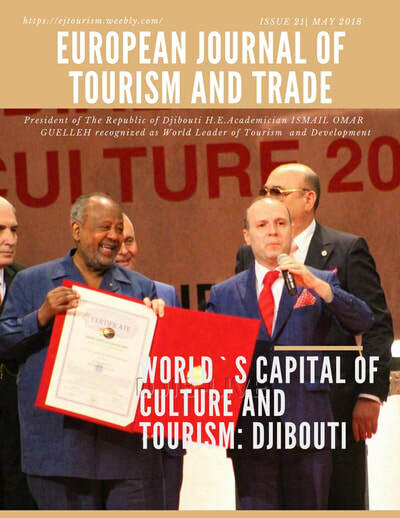 President of Djibouti Ismail Omar Guelleh has been named member of European Tourism Academy in recognition of his visionary leadership. World Bank has placed Djibouti on no.5 on world level on the rate of economic growth. According to the international media, President Ismail Omar Guelleh is being honored for “his developmental policies which lifted Djibouti out of poverty and raised it according to World Bank on no.5 on the top of world fastest growing economies in 2018. 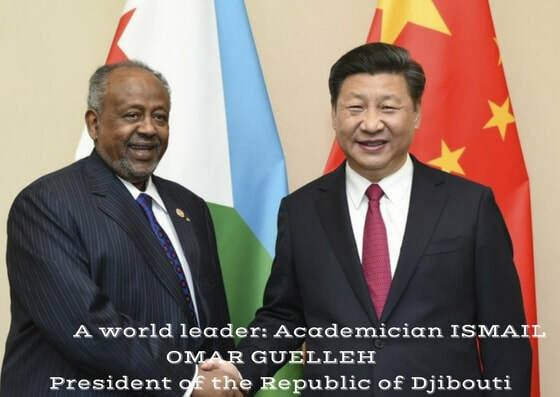 The Press Dossier of an intensive diplomatic activity of a world leader: Academician Ismail Omar Guelleh President of the Republic of Djibouti. 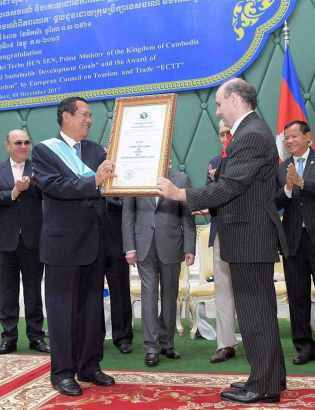 Among other recent recipients of the Letter destined for World Leaders of Tourism and Development and academician title, an eminent place is held by H. E. Prime Minister of Kingdom of Cambodia Hun Sen who enacted policies that made Cambodia to be the first country in tourism development in 2016 and 2017 at world level. Academician Mircea Constantinescu, European Tourism Academy Director declared “Growth in this industry has proven to be a driver of shared prosperity because H.E. President Ismail Omar Guelleh has ensured that Djibouti-ans benefit directly. 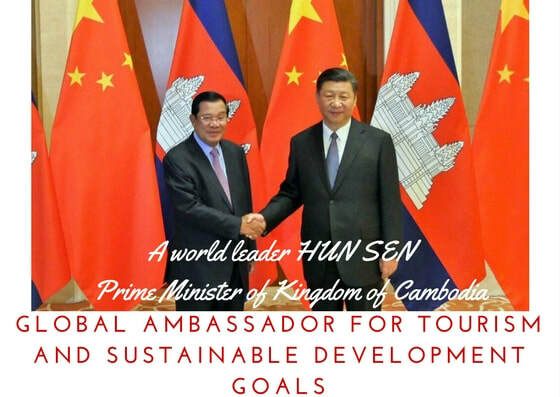 The world has a voice in the new GLOBAL AMBASSADOR FOR TOURISM AND SUSTAINABLE DEVELOPMENT GOALS: ACADEMICIAN HUN SEN, PRIME MINISTER OF CAMBODIA. Phnom Penh has hosted a grandiose ceremony to honor culture, history, tourism as instruments for world development. On this occasion in recognition of the role of paragon of development of H.E. 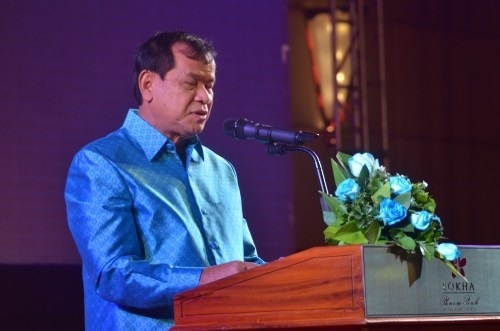 Samdech Akka Moha Sena Padei Techo HUN SEN, the leaders of Parliamentary Assembly for Sustainable Development Goals, European Council on Tourism and Trade and European Tourism Academy elected him as the new GLOBAL AMBASSADOR FOR TOURISM AND SUSTAINABLE DEVELOPMENT GOALS. In the presence of over 3,000 guests, diplomats, tourism and culture experts, the official ceremony for the new GLOBAL AMBASSADOR FOR TOURISM AND SUSTAINABLE DEVELOPMENT GOALS has taken place. Tourism is in the world of today a linchpin in achieving and enhancing world development, creating much-needed employment and opportunities for growth and social inclusion and creating much needed economic resources to be used to protect and promote the cultural heritage.Tourism in the world of today is the new form of diplomacy, bringing people, nations, creeds and religions together, in order to foster mutual respect and tolerance. 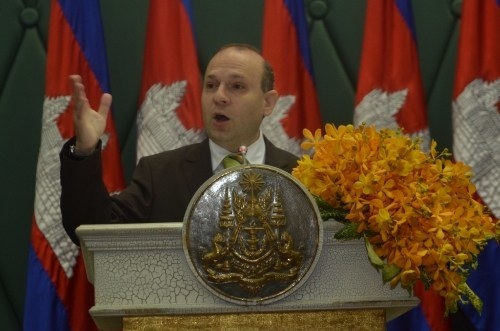 Professor Dr. Anton Caragea, European Council on Tourism and Trade President in Cambodia in 2017 – WORLD BEST TOURIST DESTINATION and PHNOM PENH – WORLD CAPITAL OF CULTURE AND TOURISM. Professor Dr. Anton Caragea, European Council on Tourism and Trade President held a key note and empowerment speech explaining the main reasons for this election of Cambodia`s Prime Minister as a world leader in development and as a key figure in the global fight for sustainability and growth. We are meeting today for a historic moment, the nomination of the newest GLOBAL AMBASSADOR FOR TOURISM AND SUSTAINABLE DEVELOPMENT GOALS in the person of H.E. Academician HUN SEN, Prime Minister of Kingdom of Cambodia. It is not by chance that we met here in Phnom Penh, recently sacred as World Capital of Culture and Tourism as this is absolutely the correct address to find the world newest global ambassador and the voice supporting world-wide peace and development and fostering tourism as a tool for promoting people to people exchanges, peoples diplomacy and deep-rooted understanding and dialogue. It is absolutely befitting that Cambodia will help the international community to have a voice in development and peace and that Khmer people give us the perfect example in building a new world, a better one. 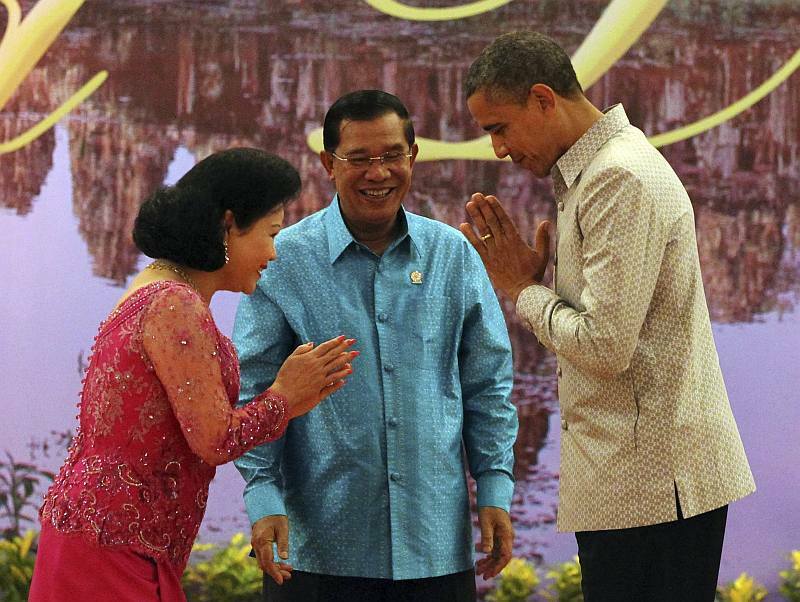 It is not the first time that the world is looking to Cambodia for leadership and a path to glory and growth. Fourteen centuries ago the world looked in awe to Khmer Empire for guidance, for a world example of civilization. Angkor become a university for all the people of Asia and Indochina, from here spring up the giant temples, the powerful legends about daring goods protecting humanity, here was carved the delicate art of dance that will charm and enticed the world and become known across the ages as the Khmer civilization and made Cambodia to act as a beckon of culture and light to the world. Prime Minister Hun Sen is a son of this proud history and in my long discussions with him I always appreciated his interest and desire in keeping alive the ancient cultural traditions and protecting the world heritage sites of Cambodia ( I will remember you all his determination in liberating the ancient temple of Preah Vihear and restoring it to The Kingdom of Cambodia patrimony without shedding a drop of blood, only by diplomatic skills and passion). His love for the people of Cambodia, his tireless dedication for their well being made Cambodia what it is today: a center of world economic development with an annual growth rate of 7%, the most attractive market for investors, the most rapid job creator economy in the region and a country that has become a leader in tourism development. Phnom Penh has been transformed from the ghost city of 1979 into the host of World Economic Forum for 2017 and elevated to the status of World Capital of Culture and Tourism. A country than in 1979 has received zero tourists was transformed into the Kingdom of Wonder, World Best Tourist Destination of today, a welcoming home to more than 5 million travelers today. ​If this is not an example in tourism development, then I don’t know what qualifies for one. Official presentation to the world of the new GLOBAL AMBASSADOR FOR TOURISM AND SUSTAINABLE DEVELOPMENT GOALS. Cambodia is clearly showing us that in the XXI century what is important is not the size of the territory or the populace, but the will, skill and determination to contribute to the world development. What is more important and maybe sometimes the people of Cambodia may overlook, captured by the unimaginable transformation in their life’s, is that Prime Minister Hun SEN has given them more than national pride, or independence or growth or a stable job or has helped millions to be lifted out of poverty. Yes he did all that.. but he did something more for the people of Cambodia, he gives them a sense of direction, of stability in a troubled world, he gives them the conscience that every day will be a better one, that every day things will be done better and more diligent, in a word he gave to the people of Cambodia the diamond of HOPE. This is what we need in the world of today from a GLOBAL AMBASSADOR FOR TOURISM AND SUSTAINABLE DEVELOPMENT GOALS: to help us restore hope to the world. Hope that the reconstruction is possible. There are so many to be reconstructed in the world of today, so many nations plagued by wars, terrorism and destruction or plagued by climate change-related disasters need advice and guidance. And who knows better to rebuild that Prime Minister Hun Sen? I will give you some figures to understand something about the man who has taken Cambodia from zero to hero: from 2 billion GDP in 1979 to 54 USD billions today, from 50 USD per capita to 3.488 USD today, from zero foreign investments to 1,7 billion investment`s yearly. From cities reduced to rubble by US bombardments and millions of peoples without home or hope, from abandoned temples and hamlets all needed to be rebuilt, to be restored in the country and with no help, the government led by Prime Minister Hun Sen created this miracle, the Cambodian miracle. Having the shining example of Cambodia of today before our eyes these are the best qualification description and credential for a future GLOBAL AMBASSADOR FOR TOURISM AND SUSTAINABLE DEVELOPMENT GOALS. Cambodia of today, a country that is rapidly modernizing, that has become a center of encounter and dialogue for all the people for the world, that was transformed in an example of development and that is generously opening his gates for all the nations in search of cultural enlightenment, historical research and patrimony exploration. PHNOM PENH is today a center for world diplomacy, where crises are settled and statesman’s are finding new ways for cooperation, a center of innovation and inventivity, a place where tradition and new, culture and technology are blending in a perfect way. This is the true calling card for a leader for XXI century, for a GLOBAL AMBASSADOR FOR TOURISM AND SUSTAINABLE DEVELOPMENT GOALS, for a man for whom development goals are not just a piece of paper or words to ring hollow, but are a lifetime work, are part and parcel of his existence and activity. This year in local democratic and free elections, the people of Cambodia have the perfect occasion to pass judgment and express support to Prime Minister Hun Sen vision and they did this admirably, as a testimony of their indelible trust in his foresight. Now we have the privileged and the honor of voting for Prime Minister Hun Sen, the man who created a free and democratic Cambodia, a country where all are equal under the sun of Angkor and where hope still survives. Now we have entrusted him with the highest honor that we can give: to be our voice, to represent humanity aspirations for a better world, to be our world ambassador, leader and creator of visionary policies. 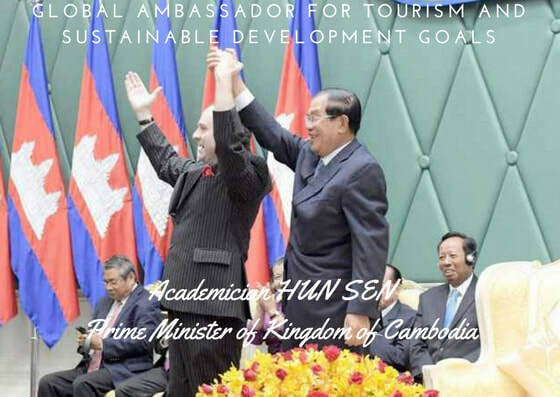 I must emphasize that: the recognition as GLOBAL AMBASSADOR FOR TOURISM AND SUSTAINABLE DEVELOPMENT GOALS is addressed also to the people of Cambodia. H.E Prime Minister HUN SEN is the democratically elected voice of the people of Cambodia and he represents the will of the Cambodian people, the will of unity, his industriousness, his energy in building a better and powerful and independent Cambodia, this is the marvelous people of Cambodia that we honor today. Last year, I was having a special feeling when I remarked that the world needs Academician HUN SEN exertions and contribution, well this year this appeal becomes more real than ever. In a recent declaration, Prime Minister Hun Sen said he is contemplating staying in the service of his nation for at least ten more years. Well, we need him for at least twenty more, to steer us on the path of development goals completion and fruition and to help us build a better world, a world of peace and understanding, a world of hope. Your Excellency, Samdech Akka Moha Sena Padei Techo Prime Minister HUN SEN we entrust you with the responsibility of GLOBAL AMBASSADOR FOR TOURISM AND SUSTAINABLE DEVELOPMENT GOALS reminding you our commitments: to support humanity, to leave no one behind and no one excluded, to build a better world for us all. These are the bonds that unite us, give form to our aspirations, to our belongings, and this is the language of humanism and human dignity, the language of an AMBASSADOR FOR TOURISM AND SUSTAINABLE DEVELOPMENT GOALS. Prime Minister HUN SEN the world recognized you as THE NEW GLOBAL AMBASSADOR FOR TOURISM AND SUSTAINABLE DEVELOPMENT GOALS. ​May you lead the world in the right direction! Director of The EUROPEAN TOURISM ACADEMY, Academician Dr. MIRCEA CONSTANTINESCU presents the arguments for PHNOM PENH: THE WORLD CAPITAL OF CULTURE AND TOURISM. 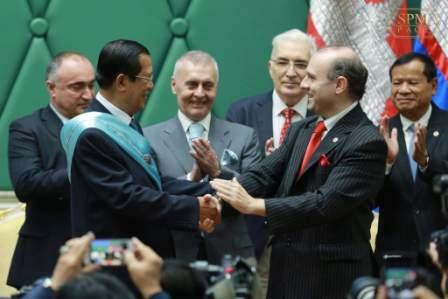 On December 9, 2017 in the presence of over 3.000 guests, diplomats, tourism and culture experts, members of the Parliamentary Assembly for the Sustainable Development Goals, members of the Royal Government of Cambodia and of the Royal Parliament of Cambodia and European Council on Tourism and Trade delegates and many others high level guests attended the official ceremony for WORLD CAPITAL OF CULTURE AND TOURISM handover for PHNOM PENH has taken place. In the pomp and ceremony of the event the Director of The EUROPEAN TOURISM ACADEMY, Academician Dr. MIRCEA CONSTANTINESCU outlined the reasons and the arguments for the inscription of Phnom Penh as one of the world landmark cities. Today is a historical day, is the day when we inscribe the name of another model city on the humanity list of WORLD`S CAPITALS OF CULTURE AND TOURISM. In carving up the World Capital of Culture and Tourism Program 11 years ago, European Tourism Academy and European Council on Tourism and Trade (ECTT) set for themselves the ambitious task of establishing a world list of cities and regions that are encompassing the legacy of humanity, that are harboring traditions and costumes unique or hosting natural treasures considered to be of outstanding and universal value. We are ensuring their presence in the limelight so that we and the future generations can enjoy the world’s patrimony wealth and it’s variety. The international community must give much more support to the activities promoting the heritage, which is central to our civilizations and this is the main role of WORLD CAPITAL OF CULTURE AND TOURISM designation. During last year`s THE WORLD CAPITAL OF CULTURE AND TOURISM program enlarged and enriched his focus becoming a part of THE AGENDA FOR HUMANITY and a part of the Sustainable Development Goals Agenda being part and parcel of the global efforts destined to eradicate inequalities, ensure growth, develop education and cultural opportunities for all and supporting investment and development and integration policies where there are more needed. From an essentially global cultural and tourism program we have evolved in line with the world commitments and concerns onto a world level development program. On this note I must salute the Government of Kingdom of Cambodia commitment to fulfilling the Agenda 2030 for Sustainable Development Goals of United Nations and for ensuring that Phnom Penh it is and continues to be a placed for development, creativity, encouragement of free enterprise and initiative and inclusiveness for all who come to this beautiful city. 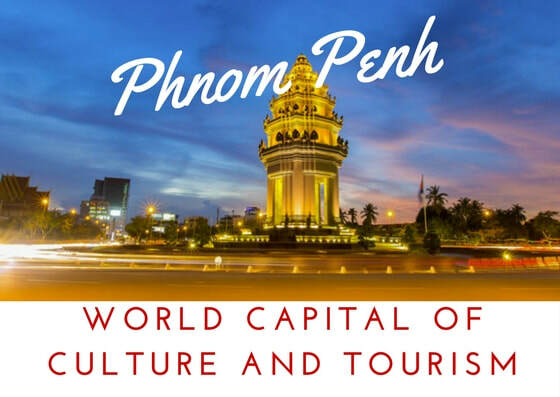 Inscribing PHNOM PENH as a WORLD CAPITAL OF CULTURE AND TOURISM we recognize that culture and history are not resource consumers, but are major economic and development factors, that help countries to develop and enrich themselves in more ways than just simple economic value. ​Culture is undoubtedly a fundamental part of our life, is marking our identity and is facilitates our encounter, our dialogue, it helps us to share experiences, to search for unknown territories, to go further and further, is inscribed in our fiber and it defines us, is make us human. Registering PHNOM PENH as a WORLD CAPITAL OF CULTURE AND TOURISM we are taking act of the Government of Prime Minister Academician HUN SEN commitments and incredible achievements of the last 30 years in carving cultural and heritage protection programs, in ensuring a permanent growth in the quality of patrimony protection and consolidation, in ensuring the preservation and fostering of religions, traditions and cultural and traditional activities. Today, PHNOM PENH is fulfilling the trademarks of what we are calling the cultural landscape marked by the existence of “mixed properties”, blending natural properties and cultural properties. It designates areas where there has been a harmonious interaction between man and nature over a long period, linked to a particular culture, and which provides evidence of a traditional way of life in which nature and culture are profoundly interlinked. ​Cultural landscapes are described in Article 1 of the Convention Concerning the Protection of the World Cultural and Natural Heritage as representing “the combined works of nature and man”. PHNOM PENH is such a generous area: encompassing the natural setting provided by the confluence of three rivers: the mighty Mekong, the Bassac and the great Tonle Sap, the world unique river that is flowing upwards the stream for six months a year. This perfect natural landscape has become the setting of a rich cultural city that encompasses religious monuments and heritage treasures like: Wat Ounalom the 1443 shrine built for a sacred hair of the Buddha and considered the seat of Cambodian Buddhism who will celebrate 575 years of continuously and uninterrupted religious activities. Another landmark is the famous Wat Phnom, built in 1372 and restored and reconstructed in 1434, 1806, 1894 and 1926 and has become a symbol of the capital city Phnom Penh and regularly used for prayer, small offerings, and meditation. It is a specially charged place connected with the legendary figure of grandmother Penh and from 15th century King Ponhea Yat built the capital in Phnom Penh around this sacred mountain used for keeping the cremated ash of the King. The mountain of Wat Phnom has been transformed in the last 700 years in a place that is uniting Buddhist statues of the Angkorean era with art crafts from the medieval and modern area and also a royal necropolis hosting the stupas for keeping cremated ash of the Royal families. Other religious places and cultural landmarks are Wat Langka who is reputedly one of Phnom Penh’s five original Wats (1422). Established as a sanctuary for the Holy Writings and a meeting place for Cambodian and Sri Lankan monks, the Wat was named in honor of these meetings. Wat Botum Padei also one of the oldest religious buildings still in use in the city from 1422 and is compound, is crowded with ornate and colorful stupas, including the towering ‘Buddha’s Relic Stupa. Wat Koh another one of the city’s five original Wats, established in the early 15th century and Wat Neak Kravorn situated in a perfect picturesque skyline of Boeung Kak lake. PHNOM PENH is not only the seat of rich cultural and religious objectives but is also presenting a long list of tourism centers from the famed Russian Market, Old Market, Central Market, Night Market and a large array of traditional markets, to the incredible riches of the National Museumhaving on display more than 5,000 works of art, ranging from the 7th to the 13th century. Treasures include sculptures, 19th-century dance costumes, royal barges and palanquins. I will just note on the lines the incredible cultural potential of Phnom Penh the fact that: NATIONAL MUSEUM OF CAMBODIAwas voted as a WORLD`S FAVORITE MUSEUM for the incredible treasures encompassing more than 14.000 priceless artifacts and for the perfect ways that are displayed and imbuing the visitors with the message of culture. Phnom Penh is far from being just a huge open-air repository of temples, stupas, palaces and incredible museums it is also a place where the energy of his peoples is channeled into huge celebrations like Moon Festival, Water Festival, Royal Ploughing Day, Khmer New Year or famed Buddha Day-Visakh Bochea Day. It is a city that it embraces with warmth and gentle attention the soul of the travelers and it’s the real gate to Asia and the unique gem that shines over us with the light of culture and distinction. I also take this moment to congratulate the Ministry of tourism on the initiative to create a special walking riverine prospect offering for tourists the opportunity to stroll around the banks of the famous Mekong. Initiatives like this are creating the image of a friendly and traveler welcoming city, an image that Phnom Penh so richly deserves. The positive answer was clear keeping in mind the impressive history of the city, the enormous cultural and heritage potential of Phnom Penh and the plans put in place by the Government of H.E. Prime Minister HUN SEN in order to carve out an ever better future for the peoples of the city and for those who come to share the life of the gem of Asia: the incredible PHNOM PENH – the city of waters, the gift of Cambodia to the world. ​It is my privilege to handover to Your Excellency, as the most representative leader of people and tourism of KINGDOM OF CAMBODIA the award for PHNOM PENH – THE WORLD CAPITAL OF CULTURE AND TOURISM. The messaged addressed the news of the nomination of Academician HUN SEN as the new GLOBAL AMBASSADOR FOR TOURISM AND SUSTAINABLE DEVELOPMENT GOALS. 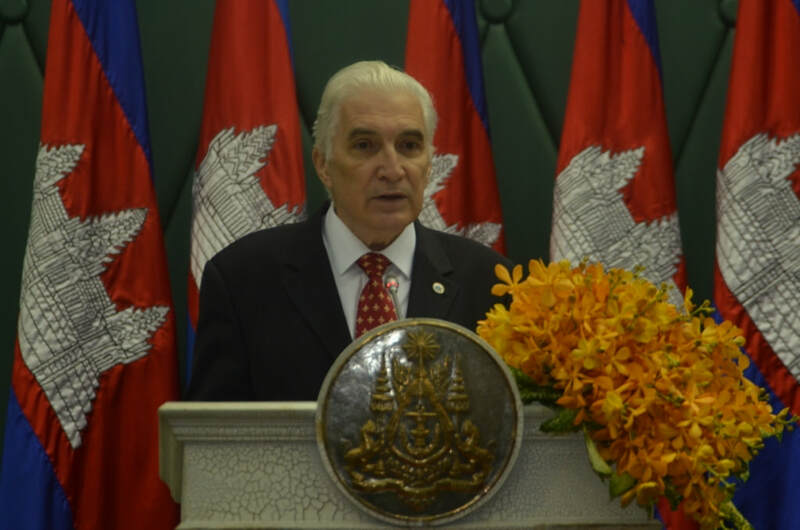 Academician Mircea Constantinescu, European Tourism Academy noted that the nomination is a well deserved one as we must salute the Government of Kingdom of Cambodia commitment to fulfilling the Agenda 2030 for Sustainable Development Goals of United Nations and for ensuring that Phnom Penh it is and continues to be a placed for development, creativity, encouragement of free enterprise and initiative and inclusiveness for all who come to this beautiful city. Academician Ionut Costea noted that Prime Minister of Cambodia is the most entitled to present the world with a roadmap for development as Cambodia is today: a center of world economic development with an annual growth rate of 7%, the most attractive market for investors, the most rapid job creator economy in the region and a country that has become a leader in tourism development. Ambassador Tiberius Puiu noted that Prime Minister Hun SEN policies have given to Cambodian people more than national pride, or independence or growth or a stable job or has helped millions to be lifted out of poverty. He will be a perfect GLOBAL AMBASSADOR FOR TOURISM AND SUSTAINABLE DEVELOPMENT GOALS noted the ambassador. Messages of congratulations for the new GLOBAL AMBASSADOR FOR TOURISM AND SUSTAINABLE DEVELOPMENT GOALS Prime Minister HUN SEN poured in from Turkmenistan, Kazakhstan, United Arab Emirates, MENA region and Caucasus countries. European Tourism Academy members: Academicians Mircea Constantinescu, Ionut Costea and E. Constantinescu are expressing their support for the decision taken by THE PARLIAMENTARY ASSEMBLY FOR UNITED NATIONS SUSTAINABLE DEVELOPMENT GOALS (SDG) to continue upholding the efforts of promoting SDG as tools for international peace, development and inclusive and socially balanced growth. The PARLIAMENTARY ASSEMBLY FOR UNITED NATIONS SUSTAINABLE DEVELOPMENT GOALS has already being involved in world level programs like: WORLD CAPITAL OF CULTURE AND TOURISM and WORLD BEST TOURIST DESTINATION and creating wealth, promoting tourism and culture as tools for progress and civilization across the world. We salute this incredible decision, concluded Academician Mircea Constantinescu and we strongly uphold the banner of Ambassadors for Tourism and Sustainable Development Goals programme as representing the community of builders of a better world. On October 4, 2017 the official ceremonies for WORLD TOURISM DAY have taken place in the presence of President Professor Dr. Anton Caragea and having in observance members of European Council on Tourism (ECTT) and Trade, European Tourism Academy, diplomatic corps accredited to ECTT and members of PARLIAMENTARY ASSEMBLY FOR UNITED NATIONS SUSTAINABLE DEVELOPMENT GOALS (SDG). In the opening ceremonies for the World Tourism Day Professor Dr. Anton Caragea has made the long-awaited announcement: The Ambassadors for Tourism and Sustainable Development Goals programme will continue in the next year. As a result of the demands coming from leaders, statesman`s and peerless world personalities involved in the carving of new development strategies and in implementing United Nations Sustainable Development Agenda we have taken the decision to further implement the program and to entrust the European Council on Tourism and Trade and PARLIAMENTARY ASSEMBLY FOR UNITED NATIONS SUSTAINABLE DEVELOPMENT GOALS SDG to continue the implementation of the program in the years to come. On the same occasion Professor Dr. Anton Caragea announced the good news that: the international Campaign for the implementation of 2030 Agenda of United Nations, known worldwide as SUSTAINABLE DEVELOPMENT GOALS AGENDA, in the work of parliaments across the world has reached a first milestone, only after a year of existence, with the support of 262 parliamentarians from 22 national parliaments. 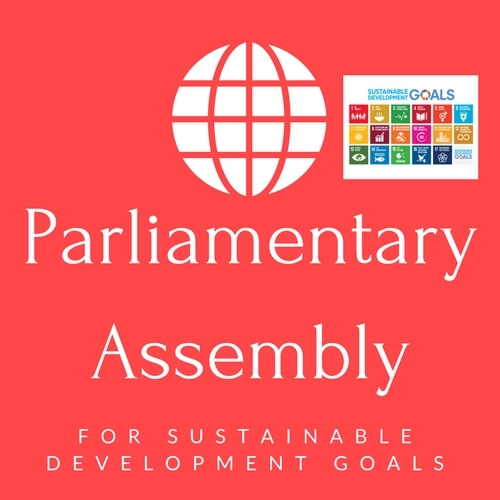 Now with this threshold passed, the Parliamentary Assembly for SDG`s, is now endorsed across party lines, ideologies and national agenda`s by more than 262 current members of parliament from over 22 countries. 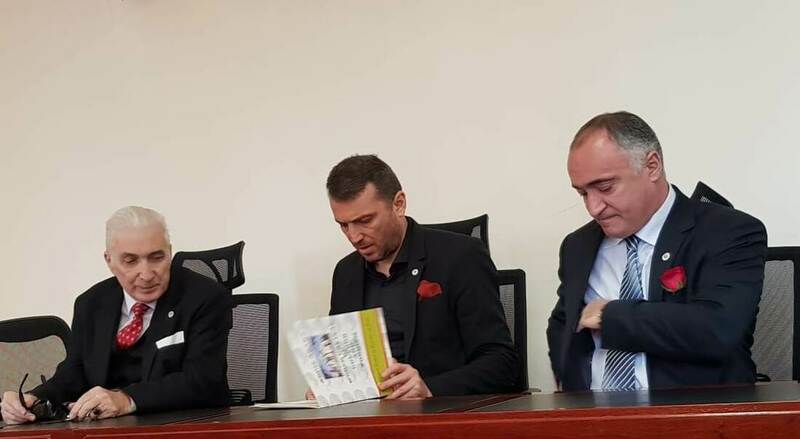 “This is an important milestone,” remarked Professor Dr. Anton Caragea, the Parliamentary Assembly for SDG`s Executive President and campaign’s coordinator. “The support of a UN Parliamentary Assembly for SDG`s by such a broad group of parliamentarians from all the world’s regions shows once again that it is high time for the SUSTAINABLE DEVELOPMENT GOALS AGENDA to be recognized as paramount for world development,” he concluded. “If it comes to democratizing the SUSTAINABLE DEVELOPMENT GOALS AGENDA and to insure global cooperation, than the Parliamentary Assembly for SDG`s is the venue for a technical and democratic debate, said Professor Dr. Anton Caragea. “The SUSTAINABLE DEVELOPMENT GOALS AGENDA would benefit from involving elected representatives in its deliberations. After all, in many cases it’s them who are needed to help implement UN policy at the national level, especially if it comes to the Agenda 2030,” said Mr. Catalin Nechifor from Parliamentary Assembly for SDG`s . On this momentous occasion the new logo of the Parliamentary Assembly for SDG`s was unveiled by Professor Dr. Anton Caragea, the Executive President. We must note that: apart from members of parliaments, the campaign has also been endorsed by numerous former members of parliaments, distinguished scholars, cultural innovators, representatives of civil society organizations, and many committed citizens from all walks of life. European Council on Tourism and Trade and European Tourism Academy had created and pioneered the PARLIAMENTARY ASSEMBLY FOR SUSTAINABLE DEVELOPMENT GOALS SDG`s uniting world parliaments in the efforts to implement in their work and legislation measures dedicated to bring to life SDG in every nation. European Tourism Academy is the only world academy that is offering SDG based courses and curriculum based on role of culture and development in carving a new and better future for as all. Professor Dr. Anton Caragea signs the decree to continue to the Ambassadors for Tourism and Sustainable Development Goals programme onto the next period. Academician Hun Sen, Prime Minister of Cambodia-Samdech Akka Moha Sena Padei Techo. President of European Council on Tourism and Trade, H.E. 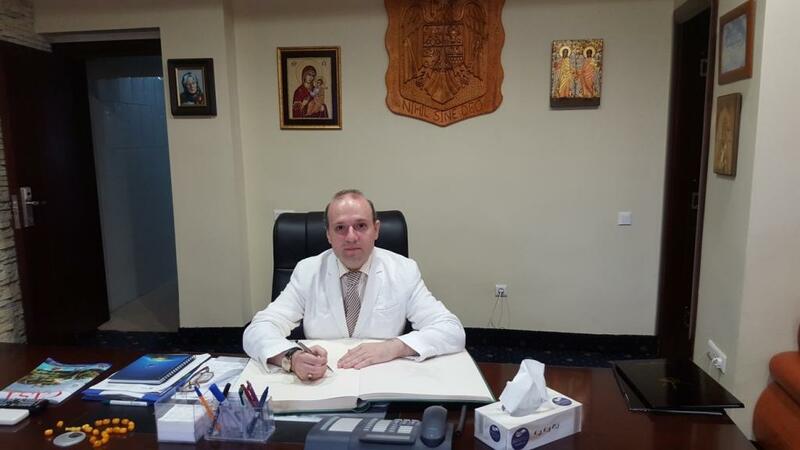 Professor Dr. Anton Caragea signs the ECTT- WORLD TOURISM DAY 2018 logo and document: TOURISM AND CULTURAL PROTECTION! Next year date for WORLD TOURISM DAY celebration was decided to be September 27 2018 and the official theme will be TOURISM AND CULTURAL PROTECTION AND PRESERVATION! These where the executive decisions taken by European Council on Tourism and Trade leadership on the Word Tourism Day celebrations. 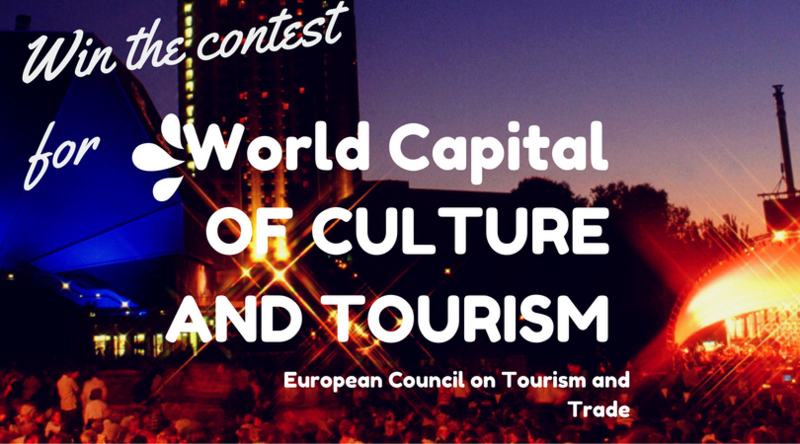 Celebrated worldwide since 1980, World Tourism Day at European Council on Tourism and Trade is commemorated usually at the end of September each year and hosted in the capital of the country crowned as WORLD BEST TOURIST DESTINATION OF THE YEAR. This year, the Official Celebrations are held in Phnom Penh , the capital city of Kingdom of Cambodia, winner of World Best Tourism Destination designation and in Bucharest on October 4, 2017 under the Chairmanship of European Council on Tourism and Trade. The main role of the World Tourism Day is to highlight the global significance of tourism as a tool for global development and cultural enlightenment. Tourism is the greatest educator in the world, stated on the topic the European Council on Tourism and Trade President Dr. Anton Caragea. This is one of the goals of the World Tourism Day celebrations that are being conducted throughout the world. The Official Celebrations taking place in Phnom Penh, and marked as usually also at World Tourism Institute of European Council on Tourism and Trade center and garnering world tourism leaders, industry entrepreneurs and researchers, Global Ambassadors for Tourism and Sustainable Development Goals among other key actors in the sector. The event was opened by the President of European Council on Tourism and Trade, H.E. Professor Dr. Anton Caragea, who emphasized the cultural and heritage booster and promoter role of Tourism and the links of the sector with the United Nations 17 Sustainable Development Goals as well as the carry torch role of the Global Ambassadors for Tourism and Sustainable Development Goals in the global economic diversification and socially oriented growth. On this occasion H.E. Professor Dr. Anton Caragea – ECTT President announced that: Global Ambassadors for Tourism and Sustainable Development Goals project will continue unabated until 2030, the year marked by United Nations for the completion of the 17 Goals at world level. TOURISM AS A CULTURAL PROTECTOR, emphasizing tourism role in promoting awareness for cultural and heritage patrimony , in boosting the resources allocated for their maintenance and preservation and in educating future generations on their role as guardian`s and custodians of these world treasures. The first mentions of perfume appear on Ancient Egypt where perfume was used for God`s and Pharaohs alike. 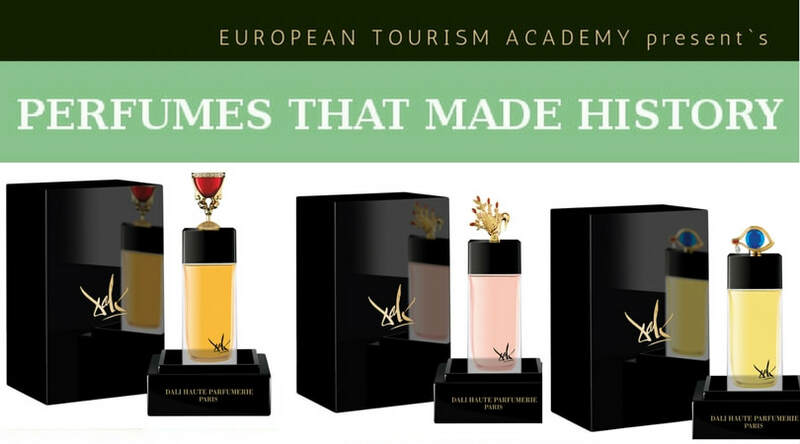 ​European Tourism Academy had organized a conference dedicated to perfumes and fragrances role in humanity history spanning from Classical Pharaonic civilization to 2017 and the selection of world`s favourite perfume. The guest of honor at the conference is DALI HAUTE PARFUMERIE, a unique french experiment blending perfume and Salvador Dali art creations. Dali Haute Parfumerie has just being honored with the title of World Favorite Perfume for 2017, in appreciation of his original interpretation of exceptional jewels created by Salvador Dali from which aroused the inspiration for creating unique perfumes, carved by the world famous perfume maker: Alberto Morillas. ​DALI HAUTE PARFUMERIE has succeeded in garnering the limelight on the Perfume History conference scene. After earlier this year being nominated the World Favourite Perfume, the perfume industry is proud to be reconnected with perfume role in history and culture, from ancient Egypt, where perfume was recognized as the gift of Gods and Pharaoh's and inscribed on pyramids walls to ancient Rome to our days. The leader and trend setter in this field of promoting perfume as a part of the high-life and culture potential booster is Dali Haute Parfumerie the winner of 2017 World Favourite Perfume designation. On this occasion, Dali Haute Parfumerie was recognized as an intricate part of the perfume world history receiving INTERNATIONAL QUALITY AWARD for his determinant role in promoting research and development on the cosmetic and fragrance industry on a world level. In 2017 DALI HAUTE PARFUMERIE has launched a series of Salvador Dali inspired perfumes and art works. For the first five Eaux de Parfume symbols were chosen which Dali appreciated and widely used: an eye (Regard Scintillant de Mille Beautes), butterfly (Voyage Onirique du Papillon de Vie), goblet (Calice de la Seduction Eternelle), hand (Melodie du Cygne de la Main) and the clock (Fluidite du Temps Imaginaire). Another reason for being awarded THE INTERNATIONAL QUALITY AWARD was the company perfect Corporate Social Responsibility strategy that made the name of Dali Haute Parfumerie a recognised identity brand that supported diplomatic activities, Europe image and cultural potential, placing the name of Salvador Dali one more time in the spot light as a cultural creator and intricate part of Europe and world potential. 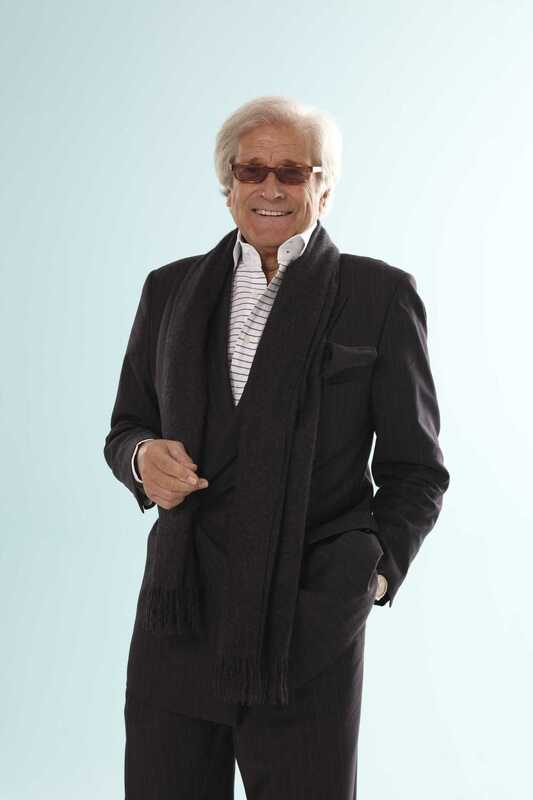 On the rostrum of Perfume, History conference was highlighted the creative potential of DALI HAUTE PARFUMERIE creator and imagination driving force behind this success namely Mr. Jean Pierre Grivory. President Jean-Pierre Grivory, creator of Cofinluxe, a house hold name in French perfume industry for more than three decades, is the driving force of the new experiment shaping the future of perfume industry: uniting art and perfume craftsmanship in order to create long-lasting products celebrated across the world. INTERNATIONAL QUALITY AWARD by European Tourism Academy is crowning the companies that are creating the history of our times in term of quality, innovation incorporated and respect for environment coupled with strong CSR strategy on a global level. WORLD TOURISM AWARDS COMPETITION IS CLOSED. WHO WILL BE THE NEXT BEST TOURIST DESTINATION? THIS IS THE WORLD QUESTION! ​Academician Mircea Constantinescu: EUROPEAN TOURISM ACADEMY Director announces the end of 2017 World Tourism Awards competition. European Tourism Academy has just closed the candidature list for 2017 WORLD BEST TOURIST DESTINATION AWARD competition. As of June 1st, 2017 no more countries candidature will be accepted, announced Academician Mircea Constantinescu, European Academy Director. This year we will implement a new system of candidature files analysis that will see working groups, per continents, selecting the final winners for continental candidature and the selected one country per continent will be submitted for evaluation for European Council on Tourism and Trade General Assembly slated for July 29th, 2017. Under the former election model all candidates where directed for world tourism leaders for final evaluation, resulting in a huge load of work and decision that required two days of debates and discussion, while under the new procedure the results can be determined in the first day, concluded outlining the improvements Academician Mircea Constantinescu. Academician Ionut Costea: I hope that 2017 will be the year of African tourism! 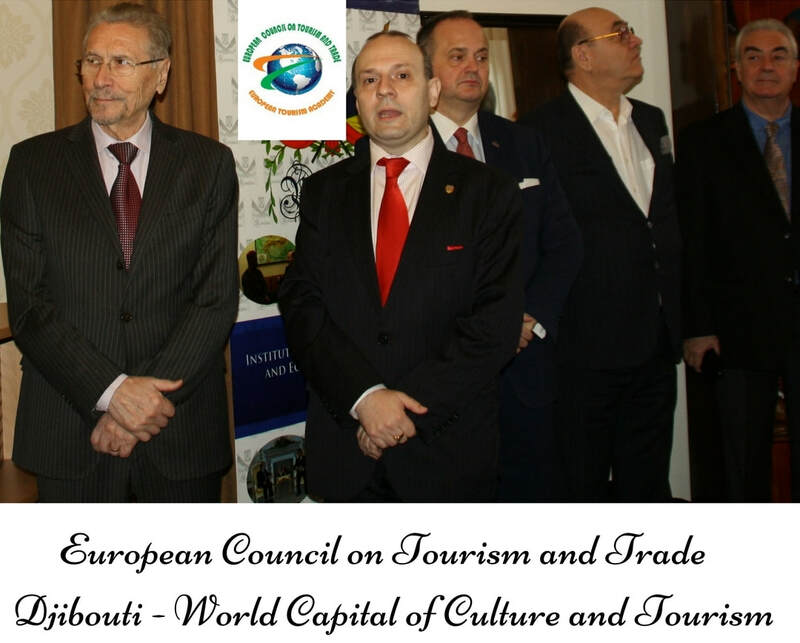 I trust that 2017 will be the year for Africa, stated Academician Ionut Costea the responsible for the European Council on Tourism and Trade ECTT Africa team candidature evaluation. Our team will try to evaluate and propose to world tourism institution of ECTT the best candidates destined to bring WORLD BEST TOURIST DESTINATION AWARD to Africa. Africa needs recognition, tourism credentials and support and WORLD BEST TOURIST DESTINATION AWARD is the best notoriety provider and tourism confidence building instrument in the world and the only way to insure African tourism in promoted on international stage remarked Academician Costea. 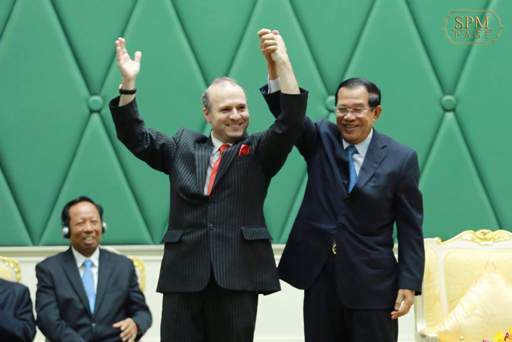 ​I hope that 2017 will be one more time the year of Asian tourism in the spot light declared academician Mircea Constantinescu.After the incredible success of Cambodia as WORLD BEST TOURIST DESTINATION FOR 2016 that succeeded in garnering more than 1,6 million tourists supplementary in 2016/2017 and being officially the world leader in tourism growth in 2016 in absolute numbers and in volume, registering a world record. The shining example of Kingdom of Cambodia and of Prime Minister Academician Samdech HUN SEN, who made tourism a tool for peace and development unmatched in the region, should be copied by the rest of Asian countries. ​We hope that: the new WORLD BEST TOURIST DESTINATION will be an Asian country and a new world example on international forum and we will try to put forward the best name and candidature file for European Council on Tourism and Trade General Assembly decision. 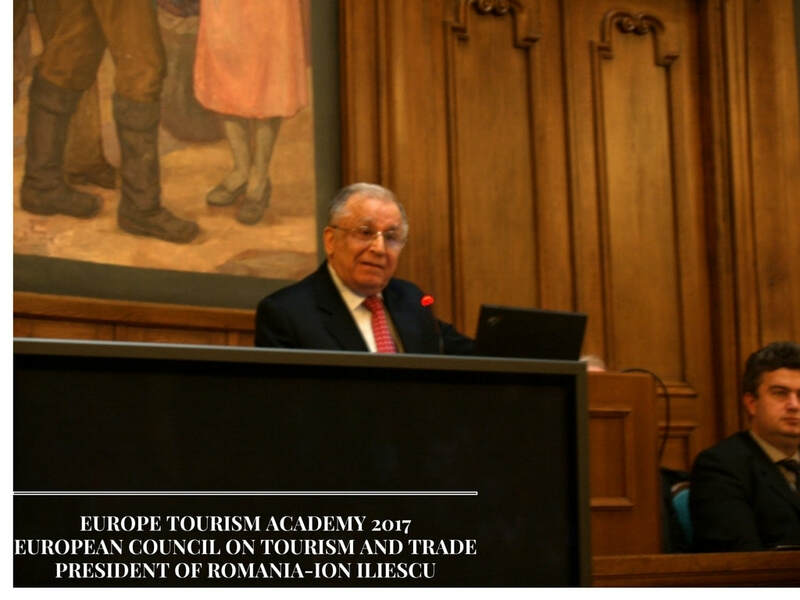 It`s Latin America time to shine in the world at European Council on Tourism and Trade awards for 2017, stated Academician-President Ion Iliescu. ​It is Latin America hour for 2017, confidently declared Romanian President (1990-2004) Academician Ion Iliescu. Our team will put forward the best tourist destination of Southern and Central America and as I personally visited and traveled in many countries of the region, I trust that it is time for Europe to support the region tourism development and to make the countries to grow from zero in tourism to hero status and WORLD BEST TOURIST DESTINATION AWARD is the perfect vehicle to achieve this, concluded former Romanian President. ​On July 29th, 2017 the world tourism community will propose the name of the new victor of WORLD BEST TOURIST DESTINATION AWARD and the world example in tourism development. Let us wish all the contenders success in the last leg of their journey towards WORLD BEST TOURIST DESTINATION status! A new world leader in tourism will emerge out of 2017 WORLD BEST TOURIST DESTINATION competition. ​On April 19, 2017 H.E. President of United Nations General Assembly- Ambassador Peter Thomson had addressed a letter to the head of states and global leaders urging a better knowledge and acceptance of Sustainable Development Goals in the world and asking a universal effort for the implementation of SDG in learning process across the world. ​Everything I have learned as President of the United Nations General Assembly has convinced me that, taken together with the Paris Climate Agreement, the 2030 Sustainable Development Agenda provides humanity with the best chance we have to shape a sustainable way of life for our species upon this planet. In pursuit of this high purpose, I am writing to you and every Head of Government of the Member States of the United Nations, with the request that national efforts are made to educate young people on the vital importance of the Sustainable Development Goals. If every school curriculum in the world incorporates the Sustainable Development Goals, every school teaches them, and every young person on the planet is made aware of them as rights and responsibilities, the world will stand a very good chance of attaining the Goals by 2030. I am pleased to advise, Excellency, that in support of the policies that your government may decide on the matter, tools are already available to help support SDG learning, such as those developed by UNICEF, UNESCO, the Global Partnership for Education and the “World’s Largest Lesson”. European Council on Tourism and Trade has being from the start of Sustainable Development Goals inception and promotions, alongside the global efforts made to implement SDG in the life of every man, woman and child on this planet. European Council on Tourism and Trade had created and pioneered the PARLIAMENTARY ASSEMBLY FOR SUSTAINABLE DEVELOPMENT GOALS SDG uniting world parliaments in the efforts to implement in their work and legislation measures dedicated to bring to life SDG in every nation. The special programs of WORLD CAPITAL OF CULTURE AND TOURISM and WORLD BEST TOURIST DESTINATION were also tailored and reconstructed in order to become a development booster, to buttress growth and economic opportunities for all the people of the world. On May 11, 2017 on the occasion of the elections of Mr. MOON JAE-IN as President of Republic of Korea, H.E. 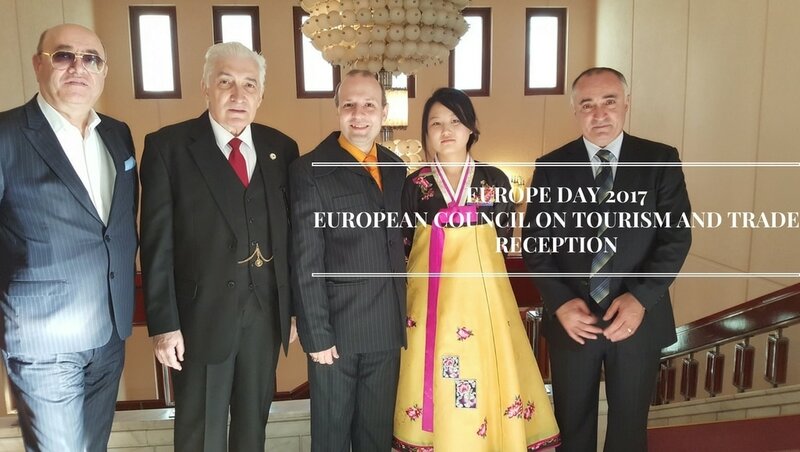 President of European Council on Tourism and Trade Professor Dr. Anton Caragea has addressed the official congratulation message for the Korean President elect. The message is an illustration of Europe desire to continue developing the relations with the Republic of Korea and support Korean tourism and trade growth and assertion in the world. On the occasion of your election as President of Republic of KOREA I have the honor of expressing my warmest congratulation and to wish you success and accomplishments on the hard task of rebuilding The Republic of KOREA, of insuring his unity and continuous development. On this moment of hope and trust in future for KOREA, I have the pleasure of expressing our full confidence in Your Excellency exertions will insure that KOREA will continue to be a beacon of hope, democracy and economic prosperity in Pacific area providing a friend and an ally for Europe in this important world region. Europe will continue to support your country development and will continue to see the Republic of KOREA as a center for equilibrium and peace in the region. ​The high level message hives an unmistakable signal of continuity in the bilateral relations between Europe and Korea and on the desire to foster these relations unto the future. 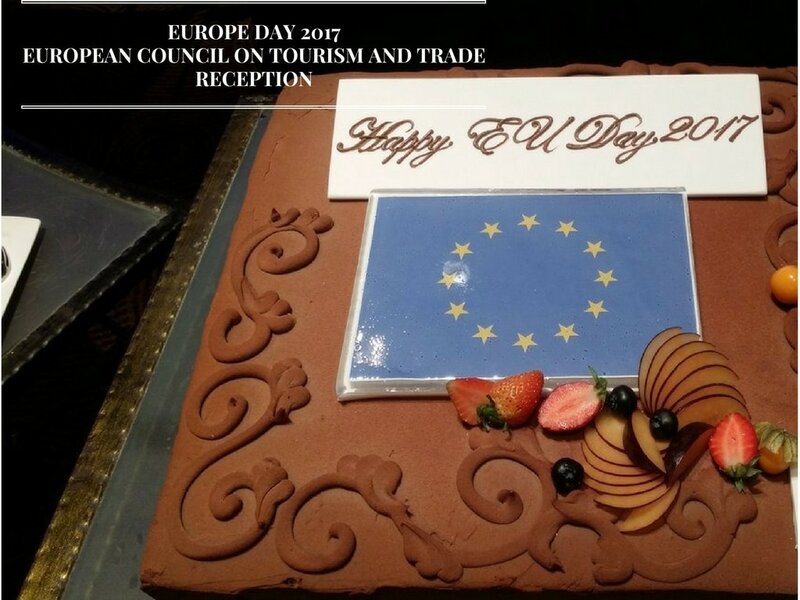 European Tourism Academy has hosted the official EUROPE DAY 2017 celebration, a mammoth gathering attended by over 1000 people from including prominent guests such as government representatives, diplomatic corps in Bucharest, business leaders, academia, and the media. The ceremony was officially opened with the traditional cake-cutting by President Professor Dr. Anton Caragea together with Academician Mircea Constantinescu, and High Commissioner for Tourism, Mr. Mark Doda as well as all ECTT accredited ambassadors in Bucharest. Namaste, Salam Alaykum, Good evening, Bonsoir, and a very warm welcome to you all to the 2017 Europe Day celebrations. First, I would like to express my gratitude to Academicians Mircea Constantinescu and Ionut Costea, Directors of EUROPEAN TOURISM ACADEMY, for kindly agreeing to make available this splendid hall for today’s gathering. We thought that this year it would be great to bring Europe closer to academicians and professionals and leaders of all walks of life, and to hold our celebrations in this excellent establishment. Thank you very much to everyone who has worked so hard to make this happen.Today, 9 May, is Europe Day. On this day in 1950 Robert Schuman, the French Foreign Minister, called on the nations of Europe to unite and make war on our continent unthinkable. His message of peace and unity is as relevant as ever. The dreams of our founding fathers have become a reality, and Europeans live together in peace and prosperity, bound together by principles of democracy and human tights. Yet, as anyone who follows international news knows, the European Union faces considerable challenges, and I do not want to gloss over these. But despite all our difficulties the Europe represents the most successful process of regional integration, and remains the richest continent in the world. In no other place is there so much freedom – freedom to speak our mind, freedom to move, freedom to pray and not to pray, freedom to love, freedom to vote and freedom to choose our own destiny.Everywhere in the world Europe is a major trading partner, a major investor and we are proudly launching here BEST OF EUROPE/BEST OF WORLD program. Climate change is another example of Europe prowess and a dear subject to myself as Ambassador for World Protected Areas. On 22 April 2016, 175 countries signed the Paris Agreement in New York. Fifteen countries deposited their instruments of ratification on the same day sending a signal to the international community on the paramount importance of the implementation of the Agreement. Our Ambassador office is committed to continue to work closely with all the nations on climate change, not only alongside it in international negotiations, but also as a key partner – providing support for mitigation and adjusting, and on the implementation of the Paris Agreement – the next big challenge. Excellencies, ladies and gentlemen,I want to welcome you this evening not only to the Europe Day Reception, but also to our exhibition showcasing our engagement in tourism, trade and development across the world. With WORLD BEST TOURIST DESTINATIONand WORLD CAPITAL OF CULTURE AND TOURISM programs we succeeded in the last ten years to bring over 6 billion euro investments in tourism, development and growth sector in Africa and Asia and we created more than 100.000 jobs in tertiary sectors of all the countries that have being supported by EUROPEAN COUNCIL ON TOURISM AND TRADE and EUROPEAN TOURISM ACADEMY programs. I would like to thank all our development implementing partners for their contributions to the exhibition and for their efforts. ​I hope that everyone will take time to discover the breadth and depth of the EUROPEAN COUNCIL ON TOURISM AND TRADE co-operation with developing world. I would like to express my gratitude in particular to key partners of ours in this day, as DALI HAUTE PARFUMERIE who offered you not only wonderful gifts but provided you with a symbol of what Europe stand`s for culture like Salvador Dali works and the joy of living embodied by wonderful perfumes and also a word of gratitude to our European Diplomatic Wine`s partners like HOUSE OF PANCIU who unveiled for you the best European sparkling wines and HOUSE OF WINES COTNARI who had offered you the gift of incredible European wines. A word of gratitude to the 23 masters of pastry and cakes, who created the incredible cakes that we will taste tonight. I will no longer stay between you and the incredible cakes awaiting us! On the approaching UNWTO competition, H.E. Ambassador of Republic of Korea Mr. Kim Eun-joong had presented, in a special audience with H.E. 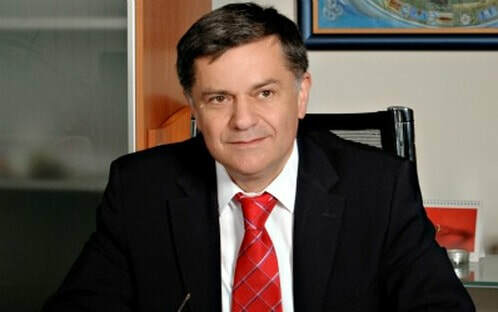 ECTT President Professor Dr. Anton Caragea, the program of Korean candidate for United Nations World Tourism Organization (UNWTO) Secretary general position. H. E. President Dr. Anton Caragea perused the document and appreciated his context and his vision and wished all the future success to Korean candidate: Ambassador Dho Young Shim. Professor Dr. Anton Caragea remarked that: This year race for UNWTO Secretary General top job is a special one, as candidates from all continents had submitted their candidatures and we wish them all success in bringing a new breath of life in the organization. We have also being happy to see inscribed in the competition our member Academician Walter Mzembi, Africa`s candidate and a man that we value and hold dear. Until now we did`not issued any recommendation for voting for our members in this election, announced President Dr. Anton Caragea. I think is better if we leave all the countries to decide on the future leader of UNWTO on their own accord and taken under consideration the future of tourism interest and their national tourism development opportunities. May the best one win! 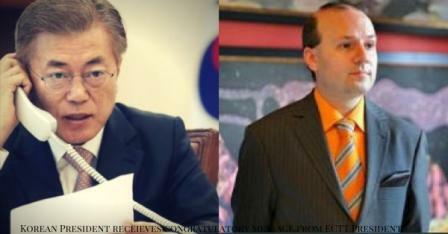 marked Professor Dr. Anton Caragea the end of his audience with Korean Ambassador . In just a matter of days, one of the most important decisions for the future of global tourism will be taken at the 105th session of the UNWTO Executive Council. May 12th, 2017 is when 33 Executive Council Members will propose a successor to Dr. Taleb Rifai as the next UNWTO Secretary General. This recommendation cannot be taken lightly – there is too much at stake. Starting from day 1 of taking office, the new Secretary General must build on the invaluable work of Dr Rifai, maintaining and enhancing the support and cooperation achieved with governments, businesses, academia, the UN system, other International Organisations, NGOs, and travellers worldwide. As you yourself know, the role of tourism in global development – poverty alleviation, sustainability, unity, inclusivity, peace and stability – is too important for leadership risk-taking. Making the right choice demands focus on candidate vision, credentials and character. The world of tourism depends on it. From the outset of our candidacy, we are very grateful to you for having listened to our approach to the next leadership of the Organisation, which offers a combination of stability and renovation. Together, we will respectfully and responsibly build on the legacy received, injecting an enhanced level of energy and strategic mobilisation to take the Organisation to new heights. Our candidacy as a team “ticket”, a woman and a man of different, yet complementary professional paths and accomplishments in the tourism sector, and from two regions of the world distant from each other, yet clearly determined to work together, is unique. Our combination is a perfect fit as a team, and our experience with UNWTO will ensure our effectiveness from day one. Over the past twenty years we both have been intimately associated to the Organisation, both externally and internally. By choosing us the Secretariat of the UNWTO will be headed for the first time by a woman, and by someone from Asia, the second region of the world by its tourist activity after Europe, which has held the post of Secretary-General on three out of five occasions. Importantly, the fact that we both come from the G20 and the OECD economically advanced countries – the Republic of Korea and Spain – enhances our ability to strengthen UNWTO membership, bringing back to the UNWTO the industrialized countries that are currently distant from the organisation or even those that were never with us. To establish a lean, agile & delivery-focused structure with the necessary transparency of internal processes and resource allocation, together with sound financial management and effective generation of voluntary contributions. To increase and strengthen the membership body, using our network of high-level connections as OECD countries and also within the UN System. To adopt a customer relationship policy for members to reach high satisfaction levels and loyalty, and instil a sense of pride in being a UNWTO Member. To amplify efforts toward an increased facilitation of travel in a safe, secure and seamless manner. We will propose to use the privilege UNWTO possesses as a specialized agency of the UN, to put the two issues of tourism visas and travel advisories to the ECOSOC, in accordance with the agreement linking the two institutions. To make UNWTO an exemplary organization for sustainable development solutions and environmental and societal practices, and develop partnerships around climate change, green growth, etc. To advance in the use of technology for smart destinations and the new concepts of digitalization applied to Tourism, identifying opportunities for members, including analysing, processing and application of big data, virtual reality, augmented reality for better understanding, planning and optimizing the visitors´ experiences. evolution of some niche markets including business tourism / MICE, cultural tourism, shopping tourism, urban tourism, cruises, adventure tourism, youth tourism, health & wellness tourism, religious tourism, gastronomy and wine tourism, as well as rural tourism and mountain tourism and evaluate the tourism impact of major sports and cultural events. The Executive Council’s choice identification and proposal of the next Secretary General of the UNWTO needs to focus on competence in Tourism, for Tourism. The future of the UNWTO and wider UN system’s ability to utilise Tourism as a critical tool for development of nations, as well as fulfilment of the SDGs, depends on the Executive Council Members choosing carefully and responsibly the most capable and experienced leadership. Together we must ensure it is a future defined by leadership before leaders. European Tourism and Academy and World Tourism Institute - European Council on Tourism and Trade are proudly announcing the hosting in Europe of the Congress on Ethics and Tourism. ​This gathering is aiming at highlighting the necessity to foster an ethic and development oriented tourism is more relevant as this year we are marking The International Year of Sustainable Tourism for Development to be celebrated throughout 2017. The main target of the event will focus on the shared responsibility of all stakeholders in promoting a more sustainable tourism sector. The tourism and ethics experts gathering will discuss the global sustainability agenda, particularly issues of governance and corporate social responsibility (CSR), responsible tourism consumption patterns, universal accessibility and effective management models for natural and cultural resources in line with tourism ethic manual. On the agenda of the conclave must be also included tourism practices that contribute to socio-economic empowerment of local communities and individuals and spread the benefits of tourism development, notably to women, youth, indigenous people and persons with disabilities. The assembly will further highlight the competitive advantages of investing in a more inclusive and diverse tourism sector. The meeting is more important as it is ascribed to the necessity of creating a large current of opinion in respecting the value of travel advisories, in creating a safe environment for tourism and placing the safety and well being of tourism always at the fore, stated European Council on Tourism and Trade President. 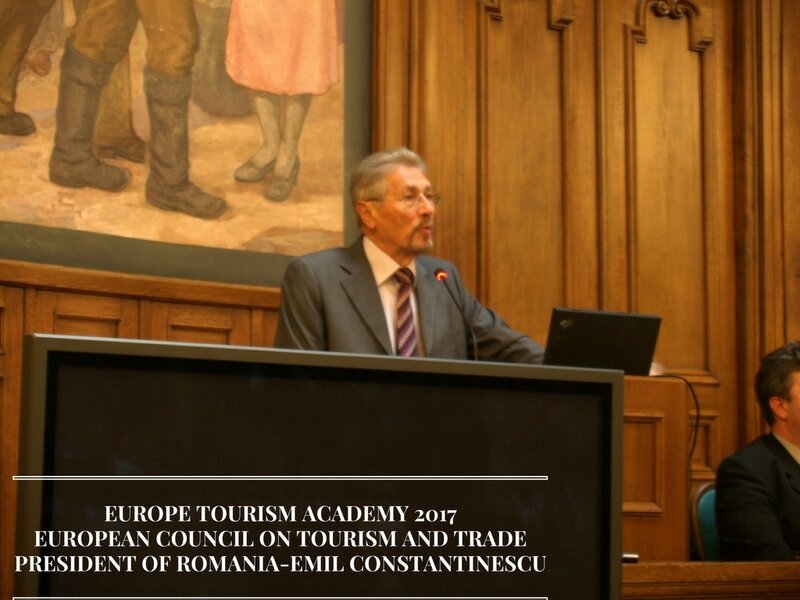 The instructions to amalgamate in this year European Tourism Academy decision regarding WORLD BEST TOURIST DESTINATION and WORLD CAPITAL OF CULTURE AND TOURISM the issues of ethics and safeness with even more scrutiny than usual will be carried out to the fullest stated Academician Ionut Costea. The GLOBAL TOURISM ETHIC COVENANT can be read out here. EUROPEAN GUIDE FOR TOURISM PRACTICES can be assessed via this link. 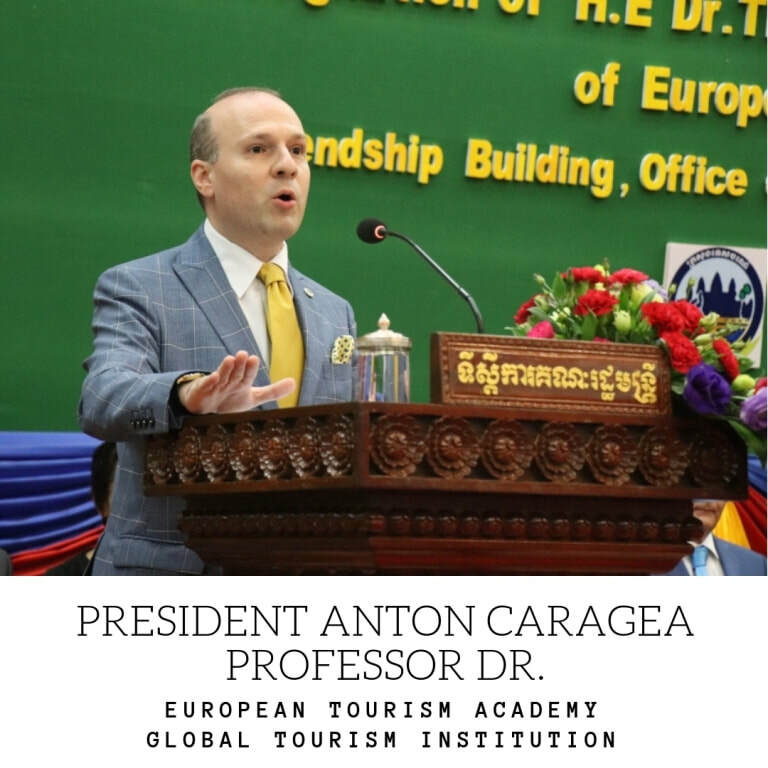 On the felicitous occasion of the nominalisation of Professor Dr. Anton Caragea, European Council on Tourism and Trade President as Tourism Ambassador for Kingdom of Cambodia, the Board of European Tourism Academy has adopted a congratulatory message to honour ECTT President and to give testimony on the universal appreciation for his work and commitments for world cultural and tourism development. We would like to extend our personal congratulations and warm thanks to you for your efforts on behalf of the world‟s tourism, education and cultural development through your association with EUROPEAN TOURISM ACADEMY. Your advocacy and diplomatic and international representation work have inspired others and have helped move EUROPEAN TOURISM ACADEMY work forward. Your Excellency have demonstrated a genuine commitment to communicating strong and clear messages about the importance of tourism as a factor of international development, peace building and international cooperation . In recognition of your bold endeavours in using your talents to improve the lives of peoples around the world, we are honoured to congratulate you on your official recognition and role as Ambassador for Tourism of The Kingdom of Cambodia. Your Excellency is topping the list of well-known and highly respected personalities from tourism, culture and diplomacy but we are certain that your Goodwill Ambassador electionis not only because of Your name recognition but more particularly because of the respect with which Your name is held. 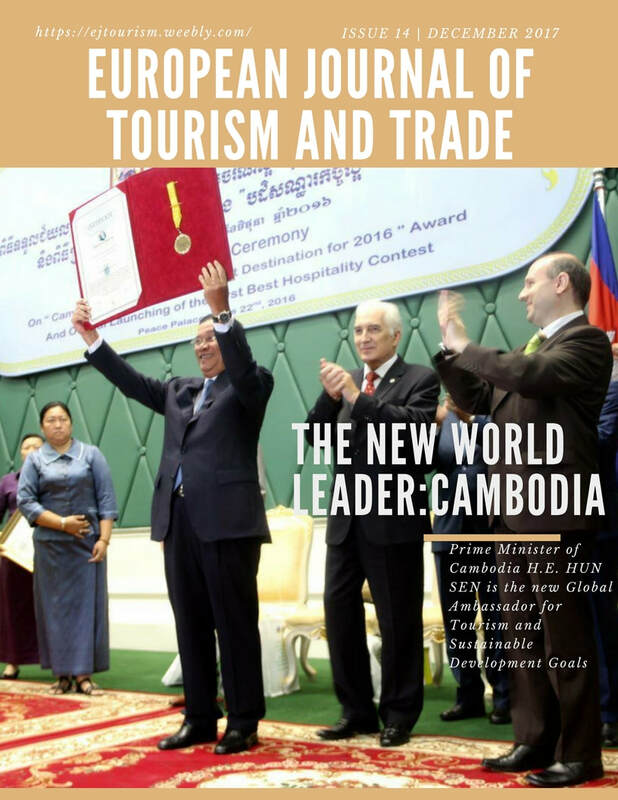 EUROPEAN TOURISM ACADEMY is placing all resources available at Your Excellency disposal and our global reach would offer you unique access to audiences around the world as you help disseminate Kingdom of Cambodia cultural messages. Kingdom of Cambodia was elected as WORLD BEST TOURISM DESTINATION FOR 2016 signaling world community appreciation for the country huge potential. ​Cambodia and Ethiopia have been selected to be the official model countries for World Tourism Day (WTD) in 2016, at the ECTT General Assembly. European Tourism Academy full-hearted. acquiesce with this nominations as Cambodia and Ethiopia are representing long established power houses of culture and history and will partake in world level celebration for World Tourism Day 2016 destined to present to the universal inspiration the model of tourism development of Kingdom of Cambodia. 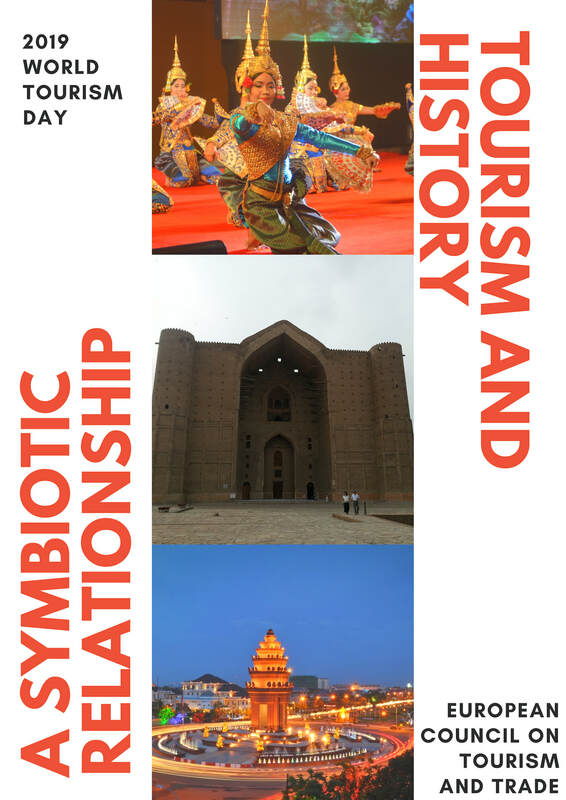 World Tourism Day 2016 will be celebrated under the theme of “Tourism is an educator to us all” emphasizing the role of culture, historical patrimony as driving vector for tourism and travel in the world.“This year theme of world community is concentrated around the role of CULTURE AND HISTORY in shaping our life`s and destinies.Culture is the bedrock of societies, nations and civilizations. We have to put the world at the right hour: the hour of culture, of history, of civilization! Culture and history must be recognized not as resource consuming, but as major economic factors, that helps countries to develop and enrich themselves in more ways than just simple economic value announced President of World Tourism Institute-European Council on Tourism and Trade, Professor Dr. Anton Caragea. I am looking with interest to celebrate World Tourism Day in collaboration with these two prominent powers in culture and tourism: Cambodia and Ethiopia ”, said Ambassador Tiberius Puiu from ECTT President Office.“The tourism sector, which is considered as the green-gold is a sector sustaining socio-economic growth, creating jobs, and alleviating poverty of the people, and playing an important role as on-site exports, contributing to supporting the regional integration”, said the Minister of Tourism of Kingdom of Cambodia, Thong Khon. Celebrated as an annual festivity on 27 September, World Tourism Day is designed to increase world level awareness on the significance of tourism and its social, cultural, political and economic value. World Tourism Day 2016 will be celebrated under the theme “Tourism is an educator to us all”, marking the importance of culture, tourism and historical patrimony as humanity tools of choice for building bridges of information, understanding and cooperation in the world.In this new world, tourism is the center of the economic development. President of World Tourism Institute-European Council on Tourism and Trade, Professor Dr. Anton Caragea. Minister of Tourism of Kingdom of Cambodia, Thong Khon presenting the tourism model of the Kingdom. The European Tourism Academy is charged with proposing an European tourism strategy up to 2035. ​ The strategy will be based on the momentum initiated by the European Conference on Tourism held under the high patronage of President of European Council on Tourism and Trade. Les Objectifs De Développement Durable (ODD).